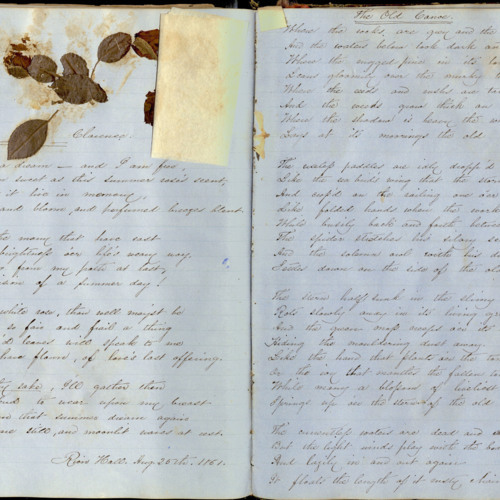 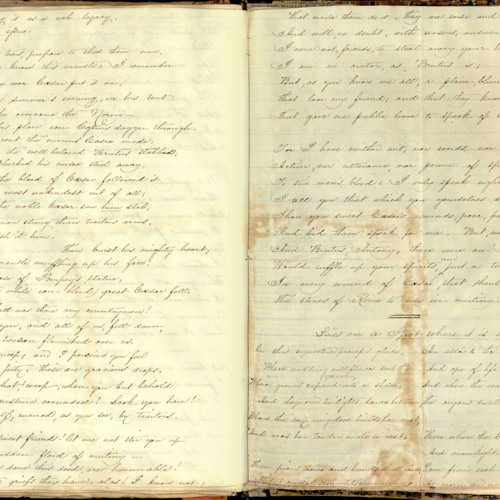 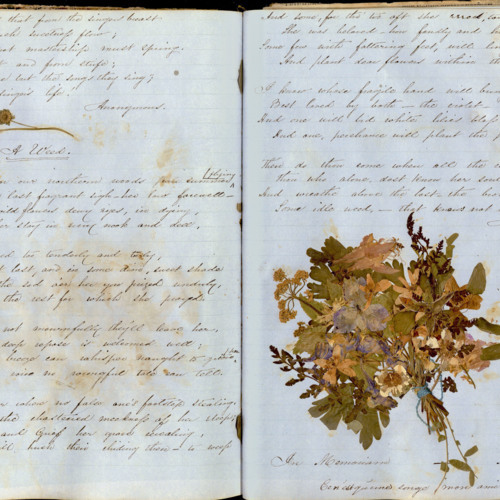 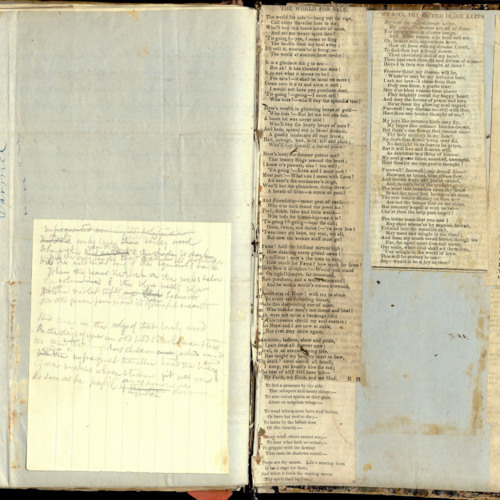 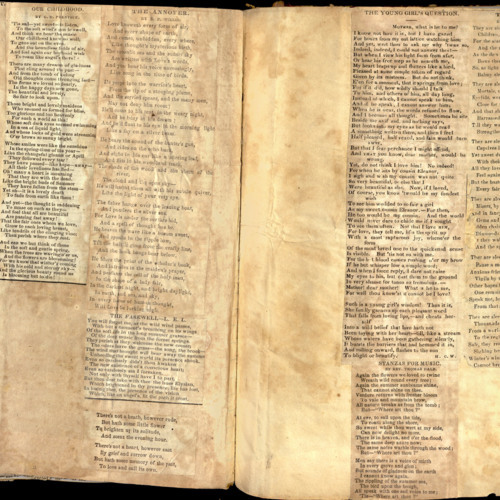 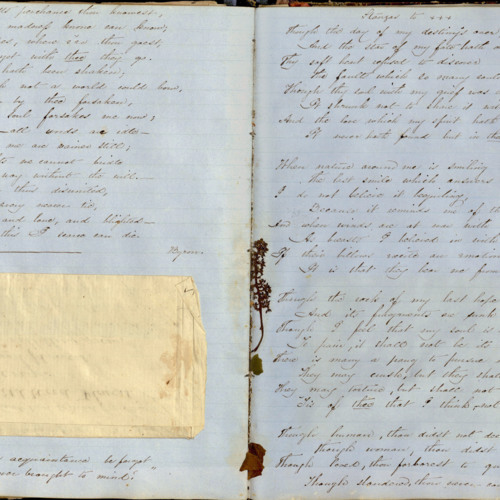 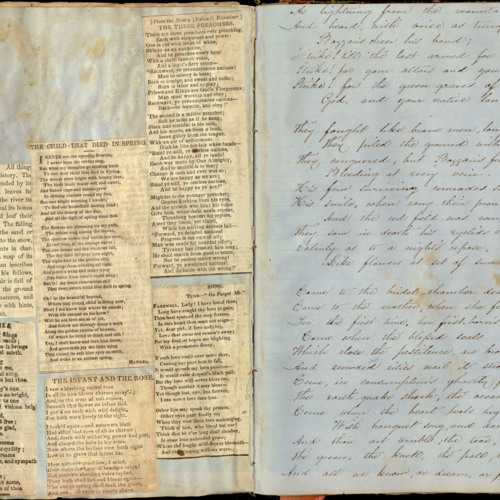 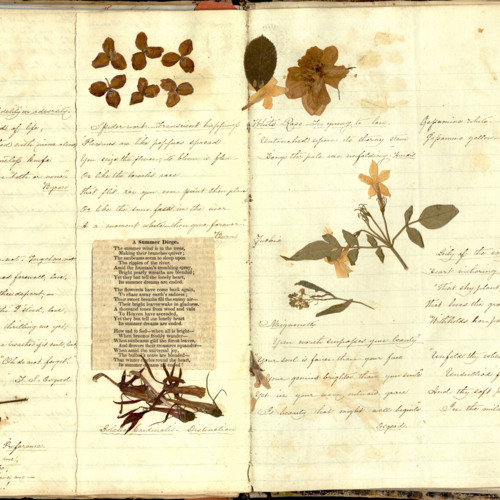 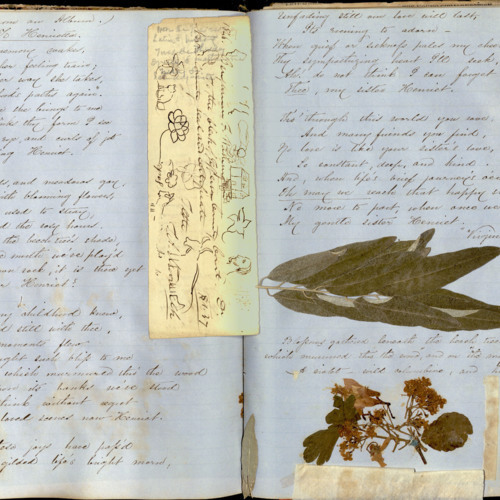 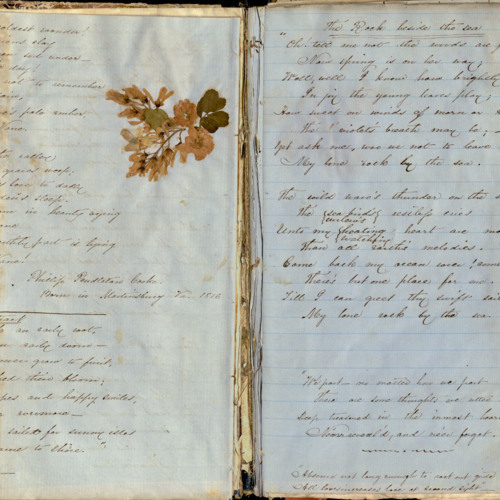 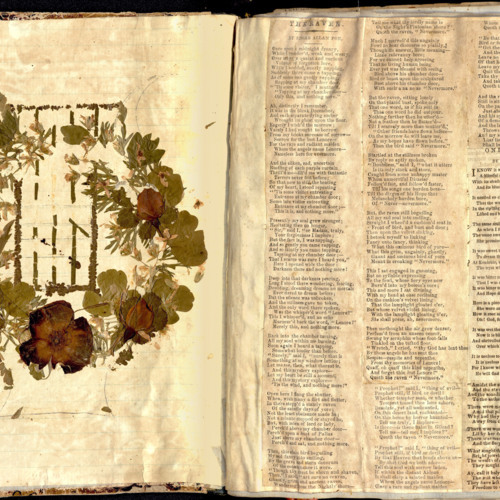 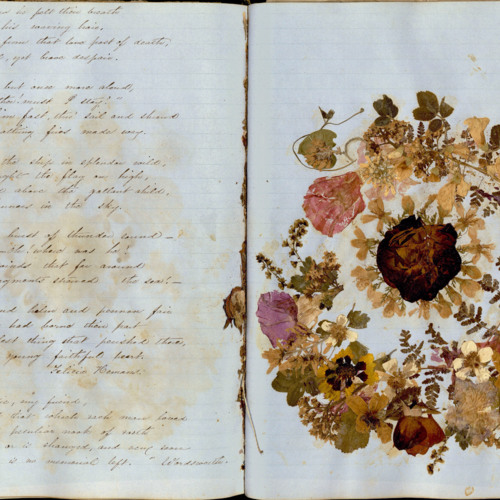 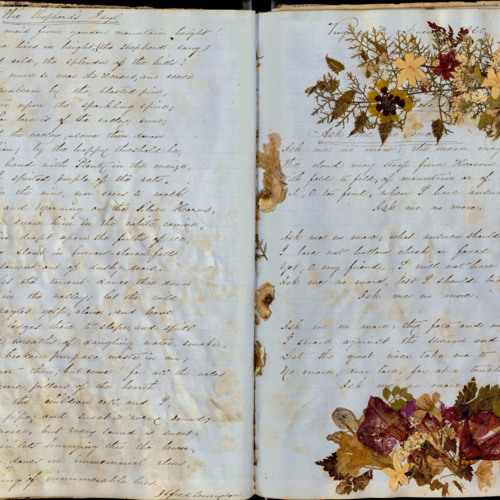 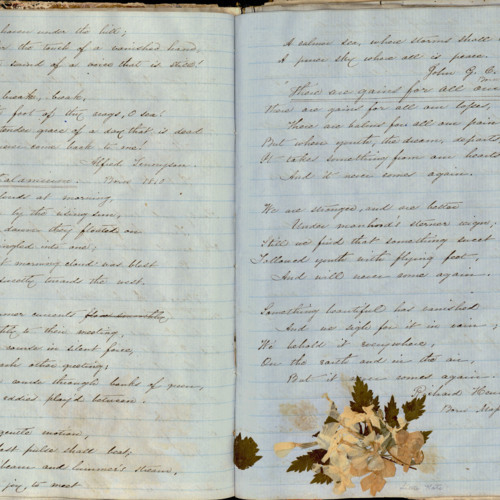 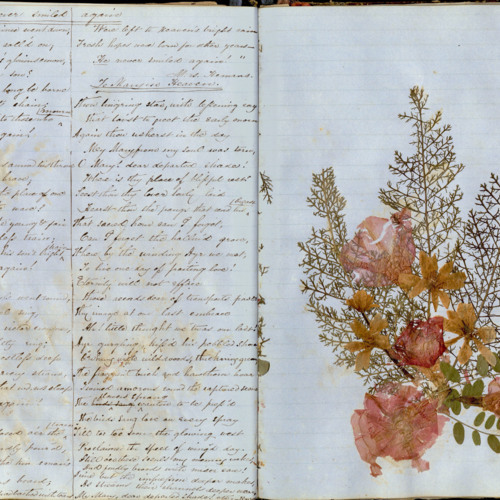 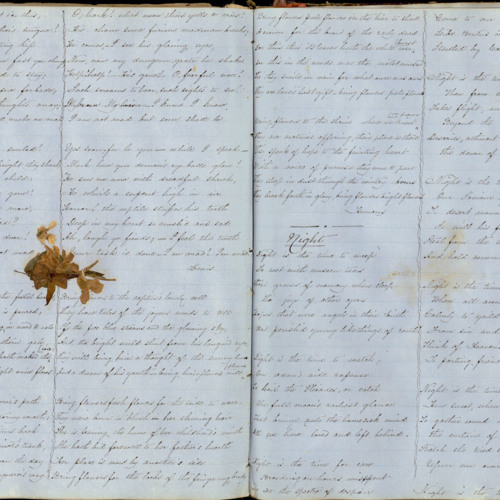 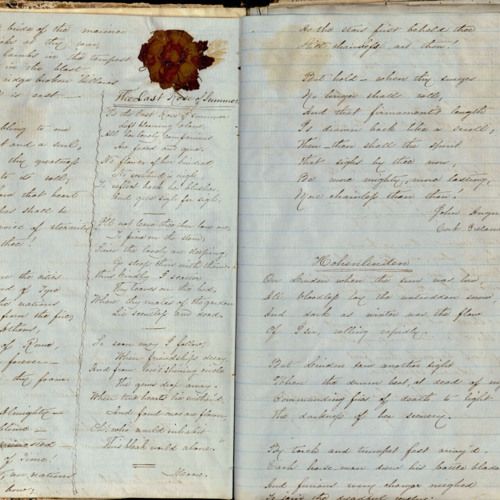 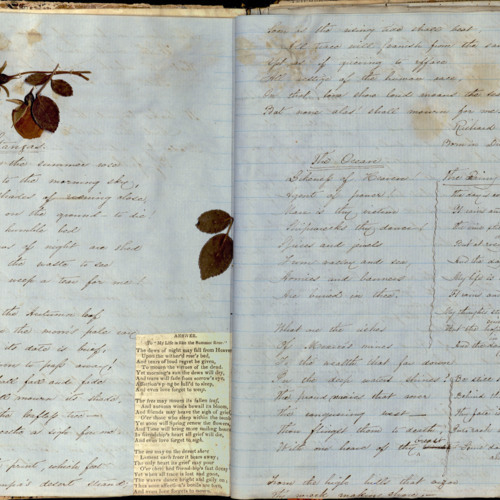 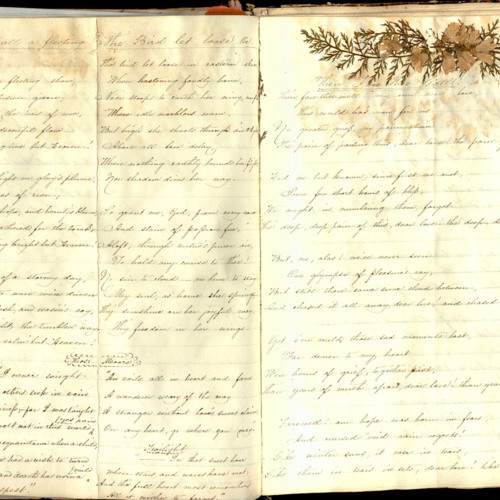 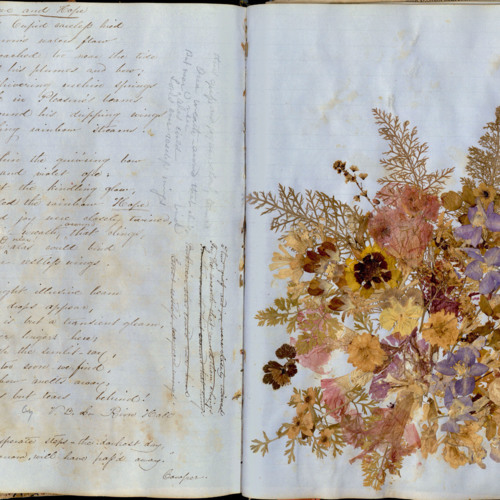 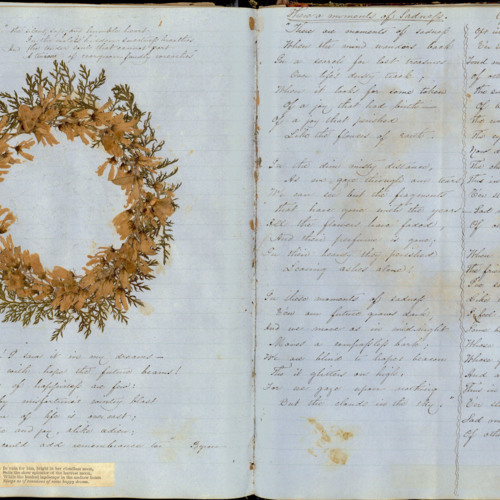 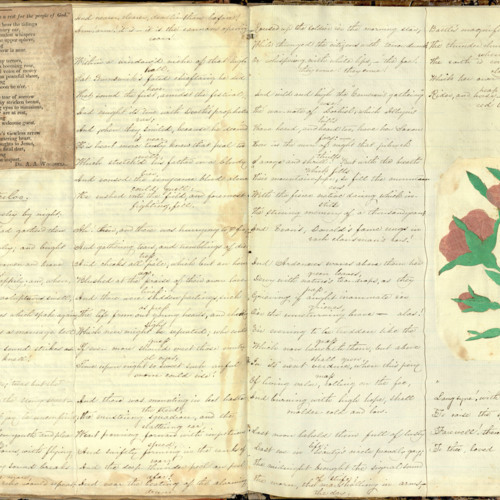 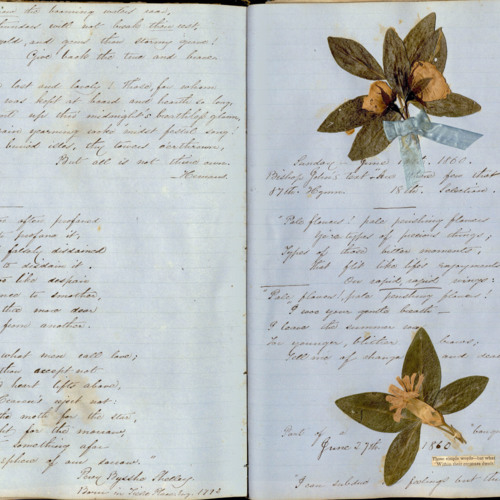 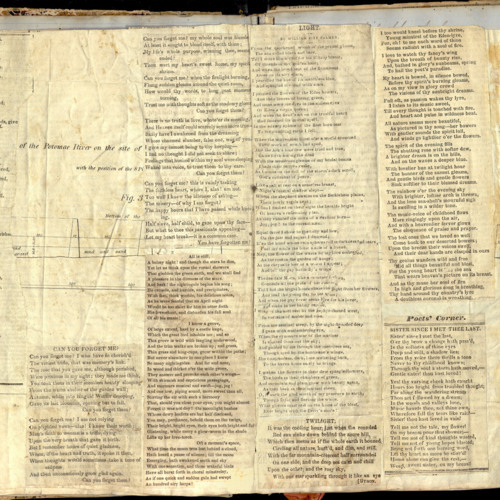 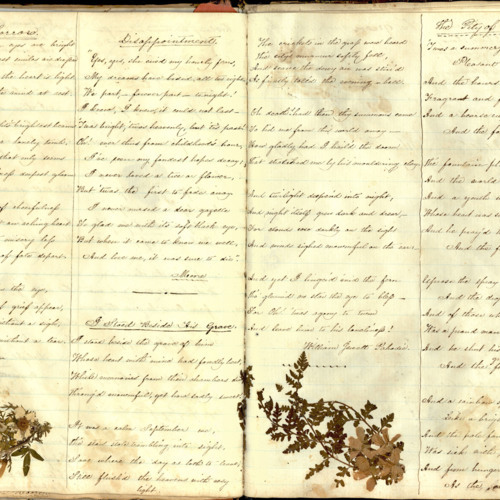 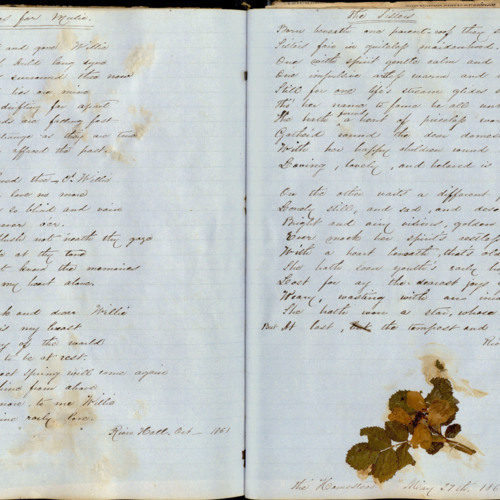 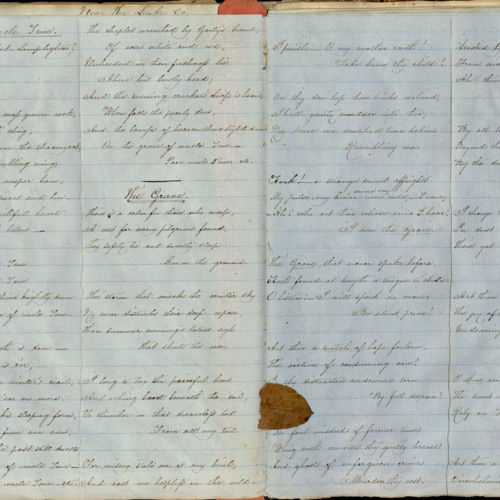 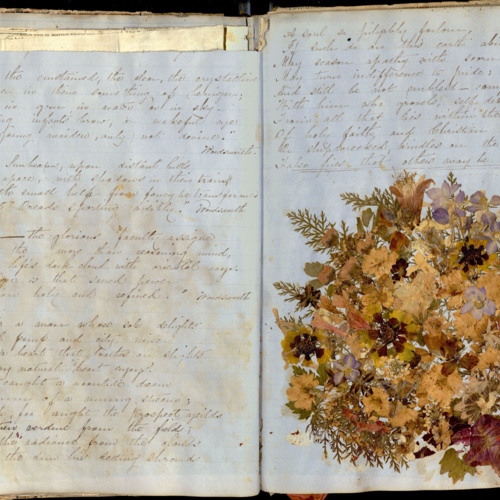 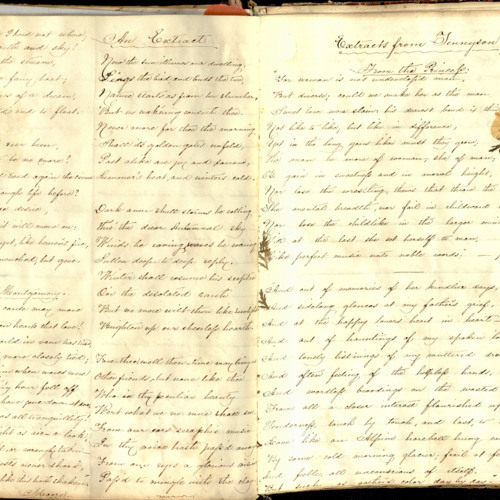 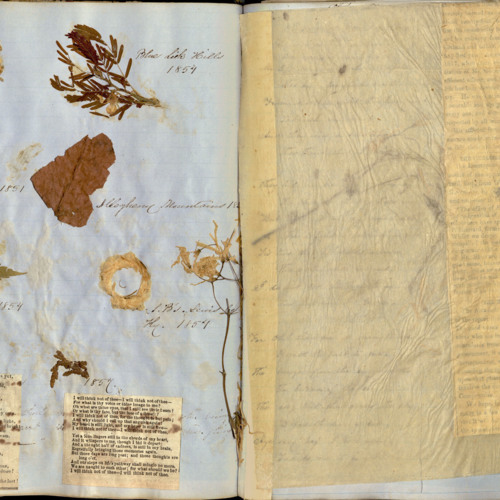 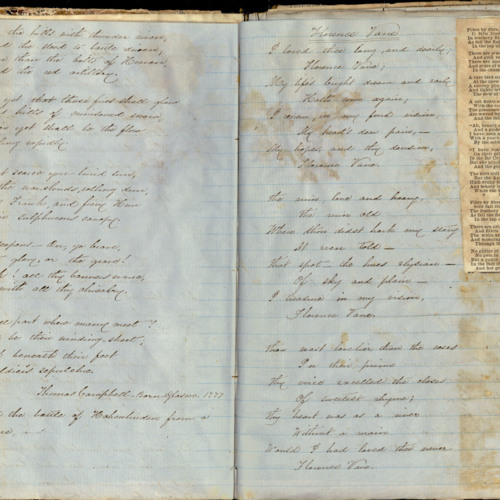 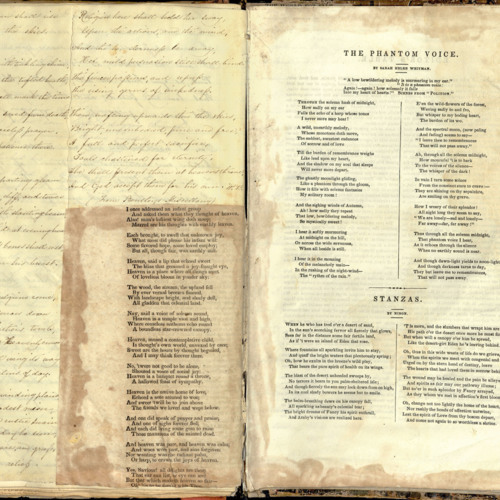 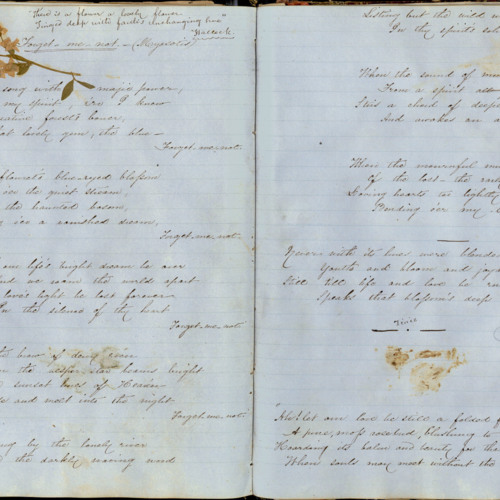 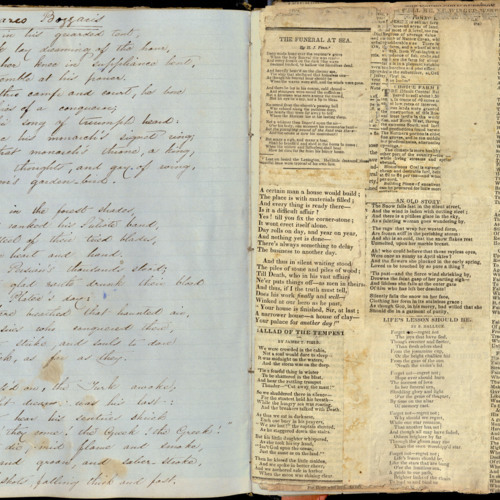 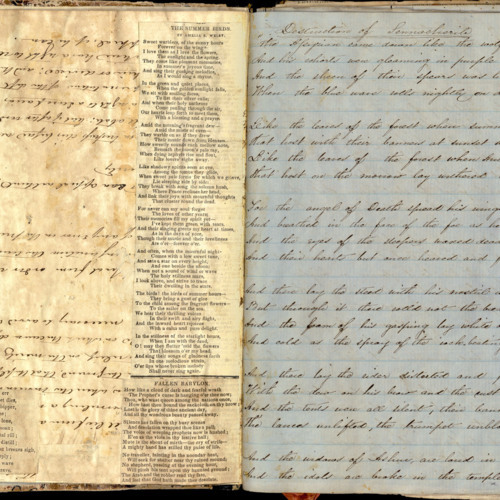 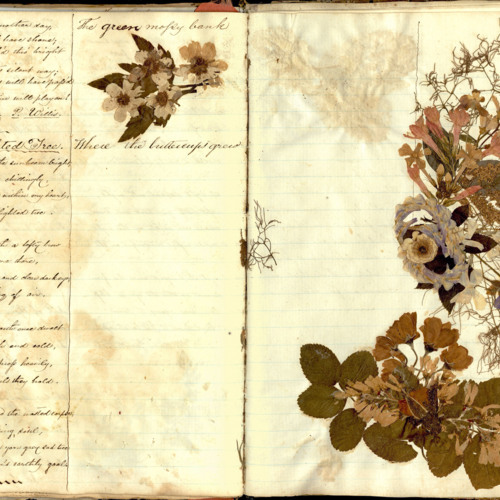 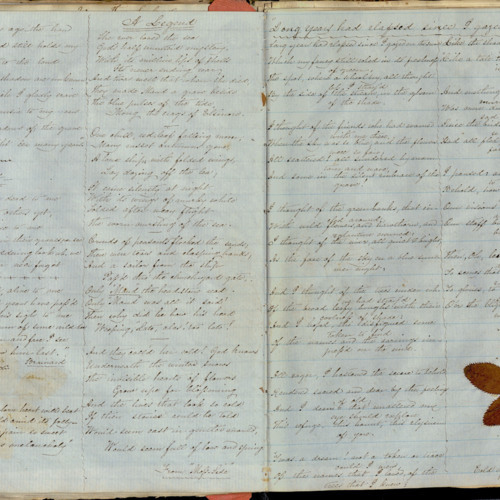 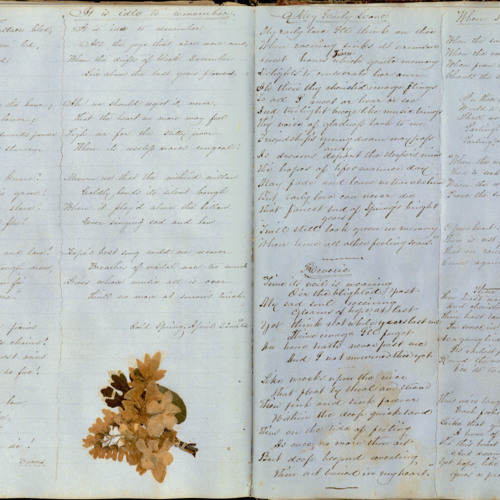 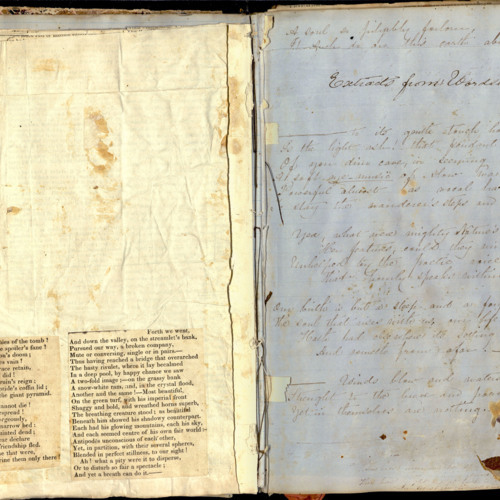 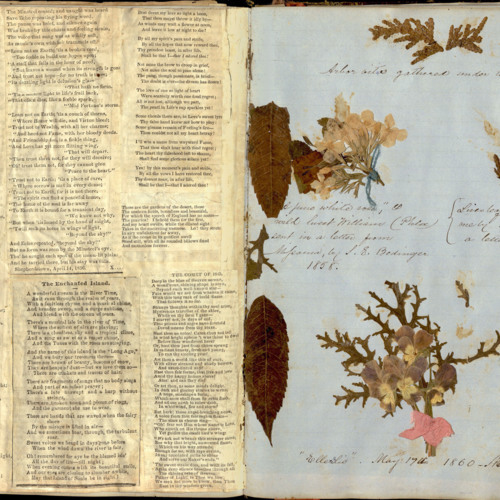 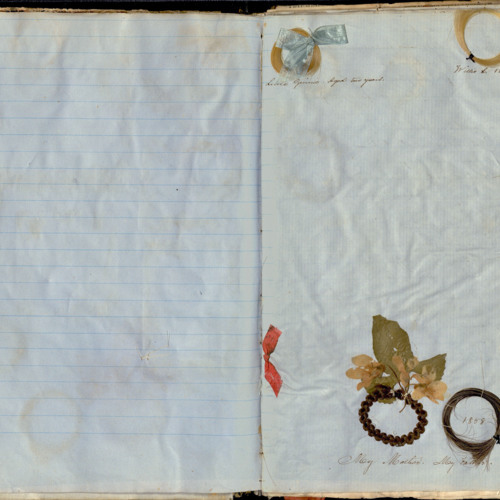 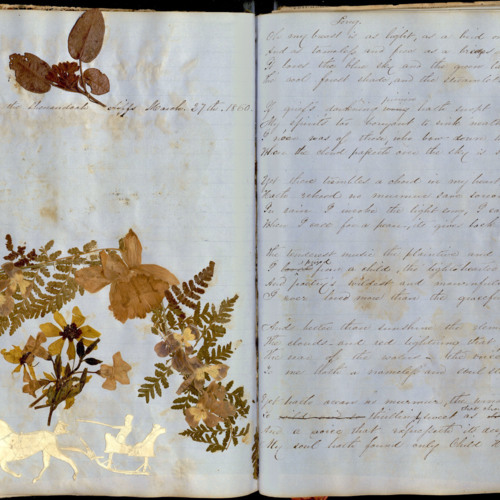 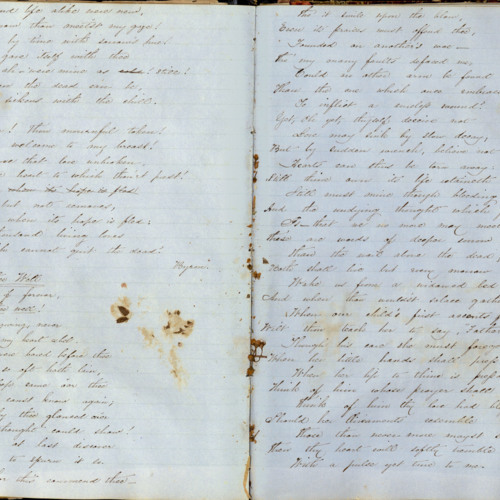 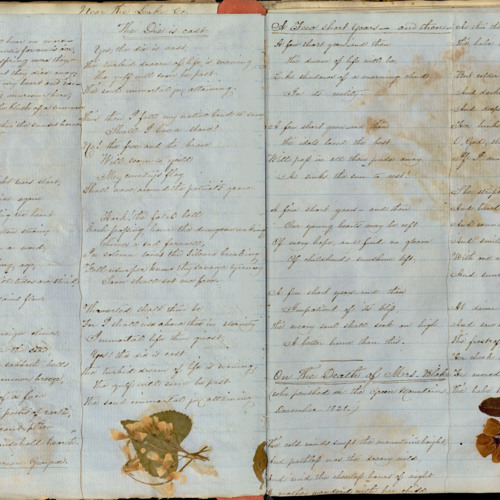 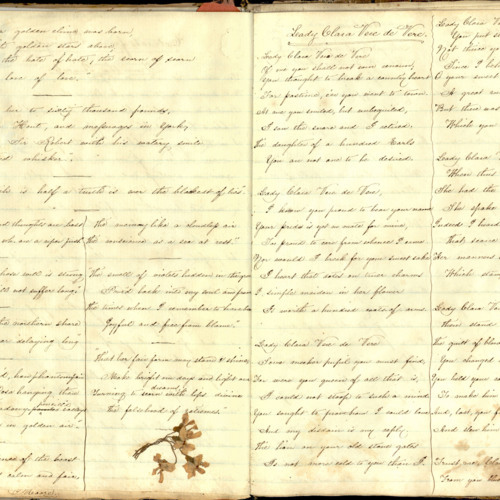 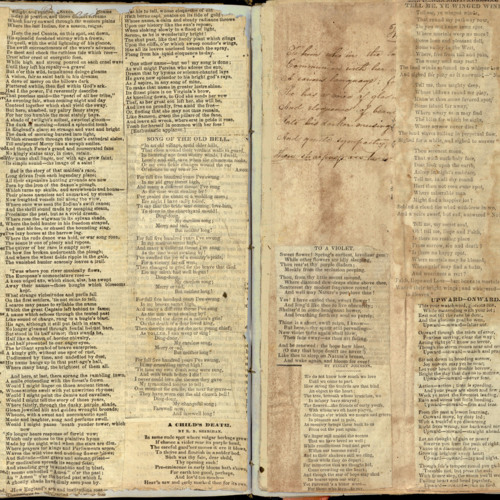 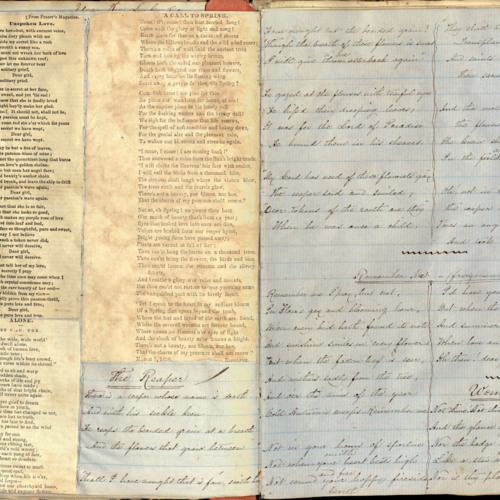 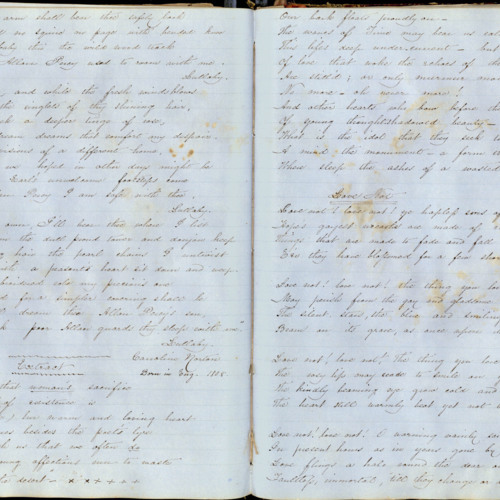 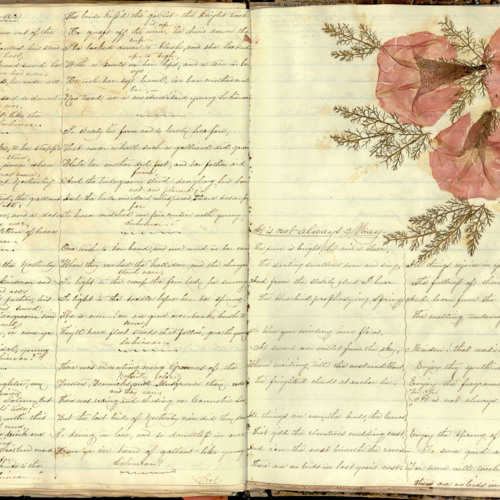 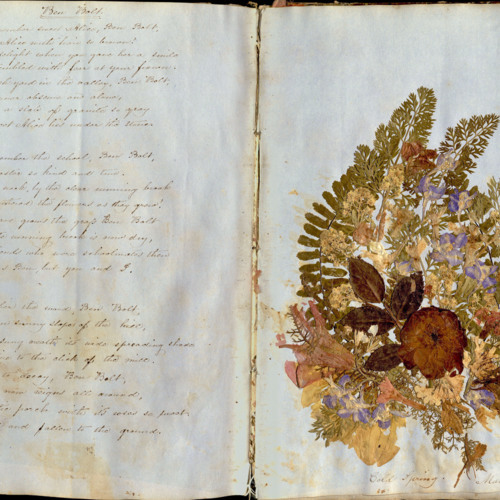 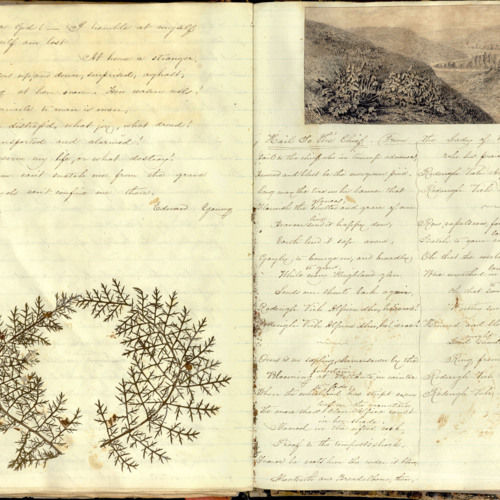 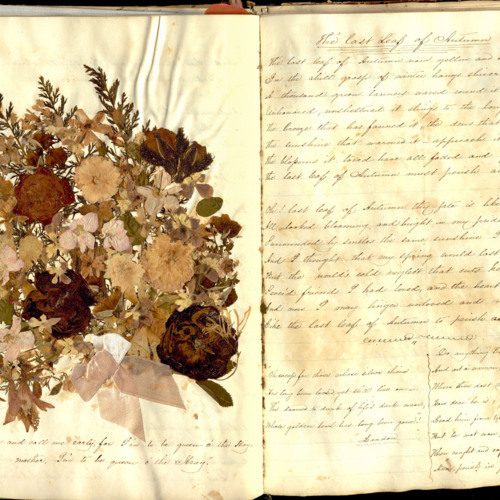 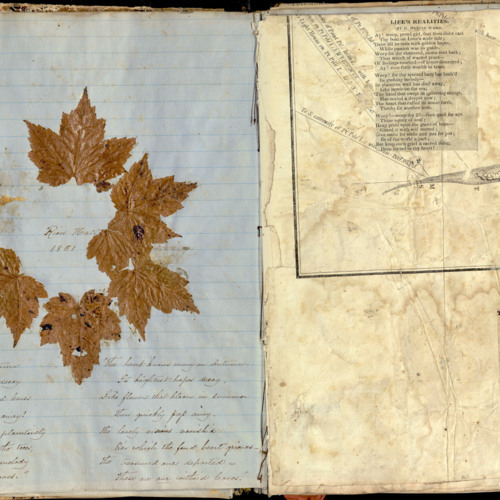 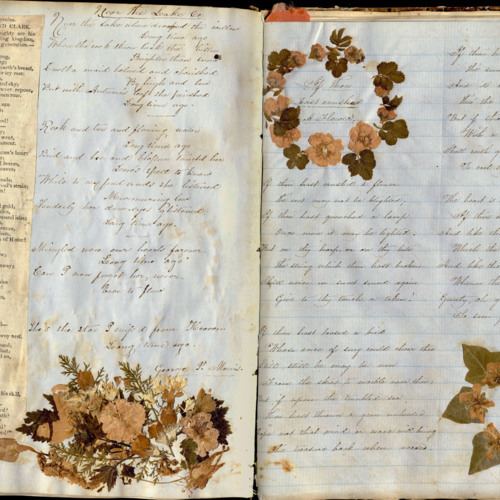 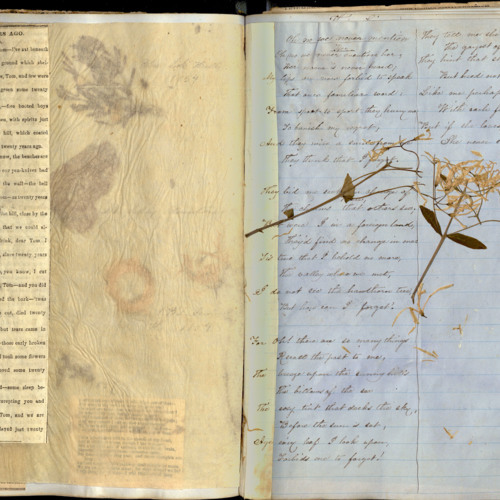 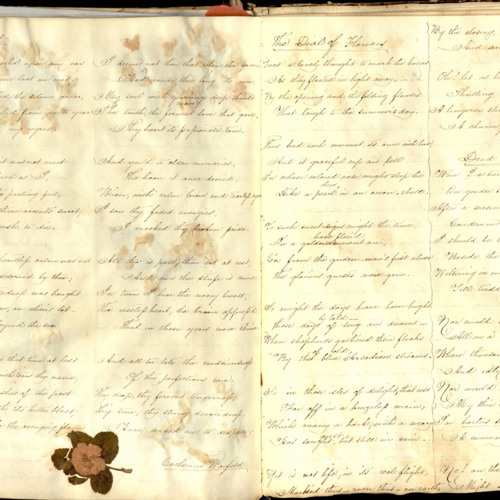 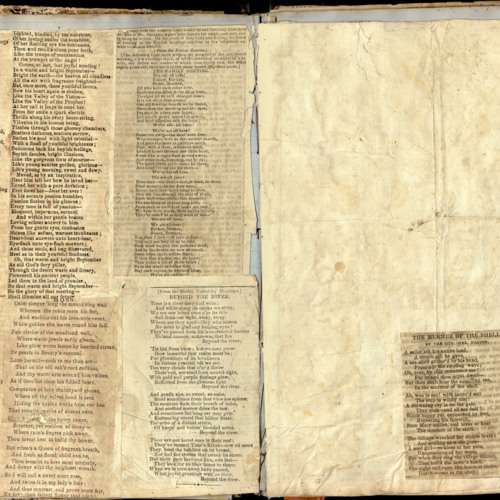 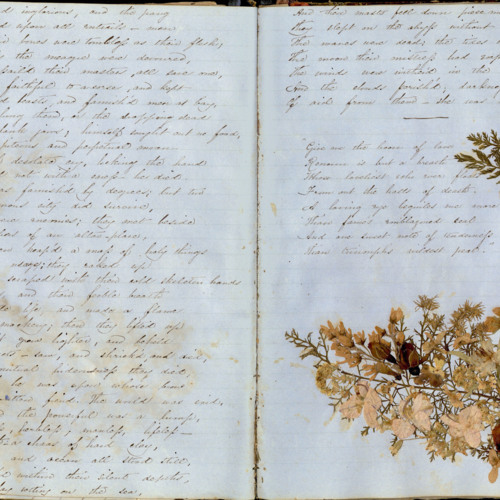 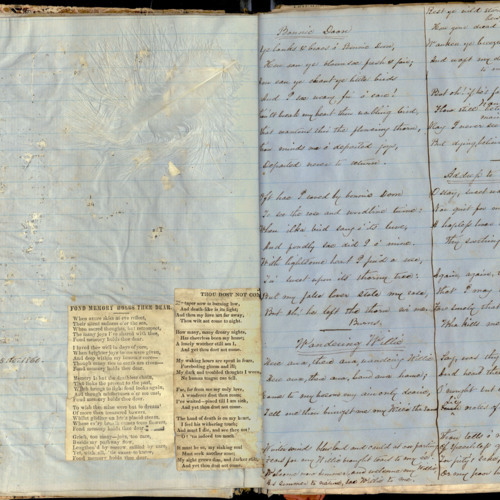 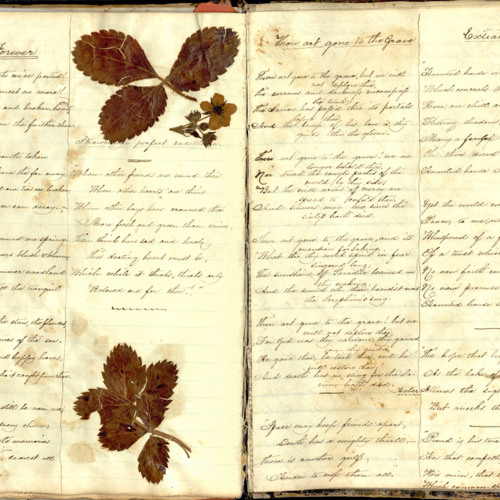 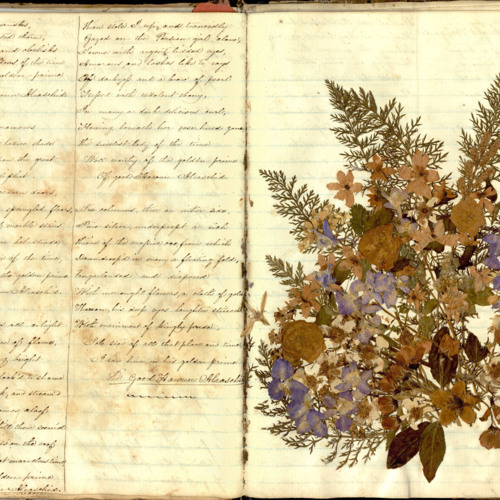 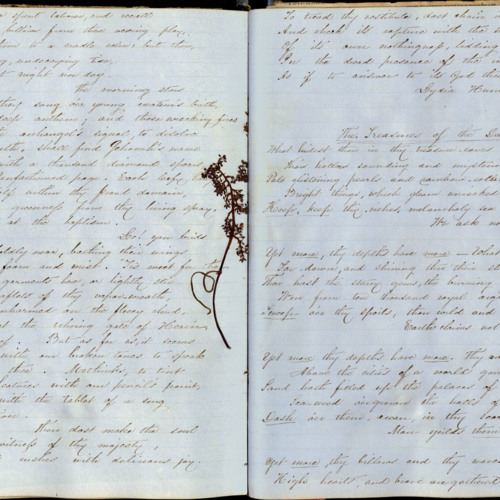 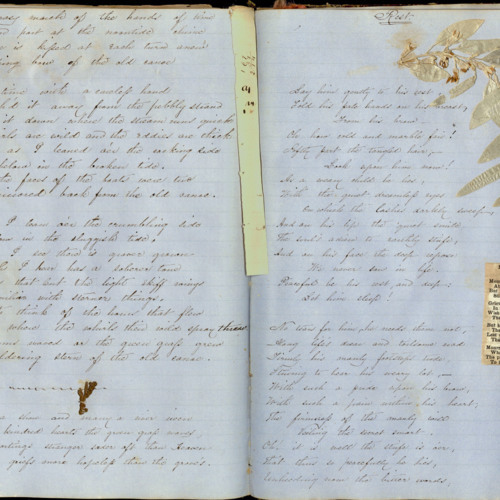 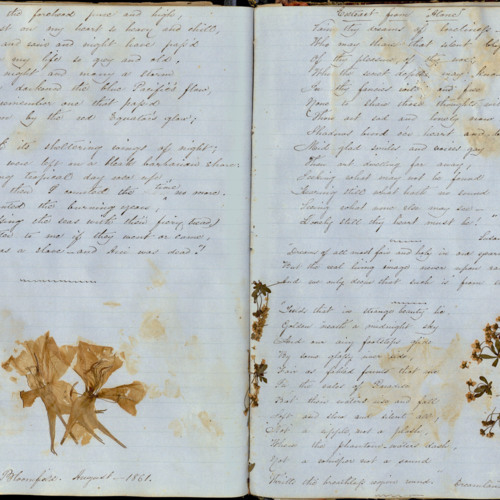 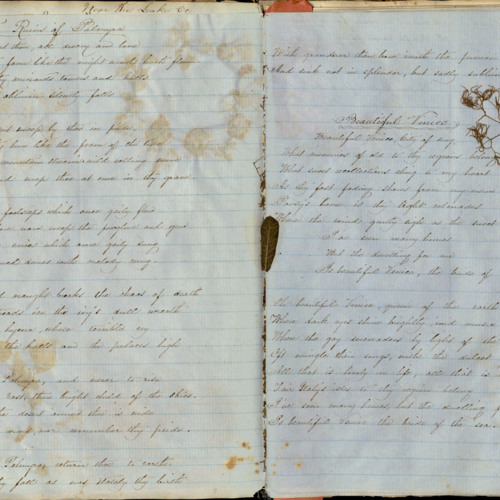 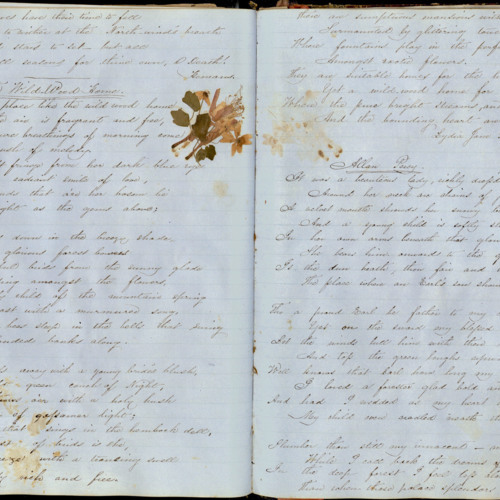 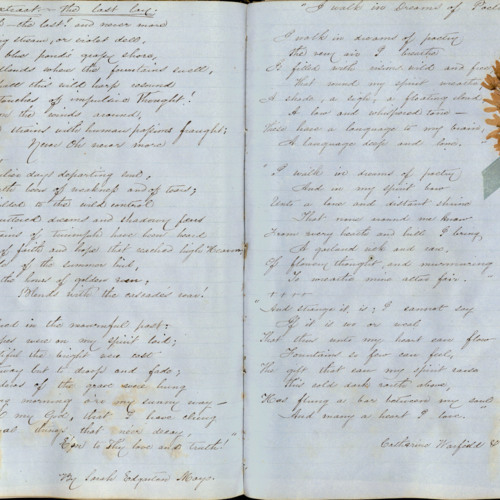 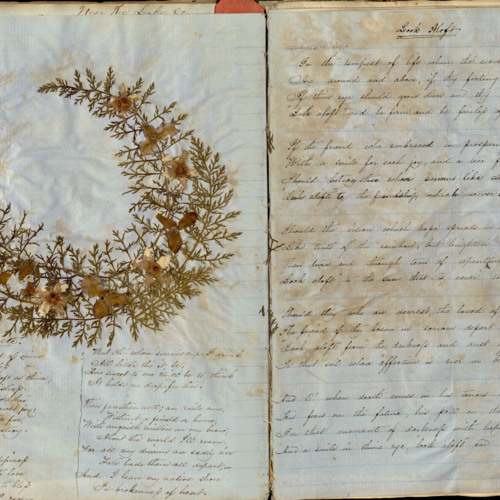 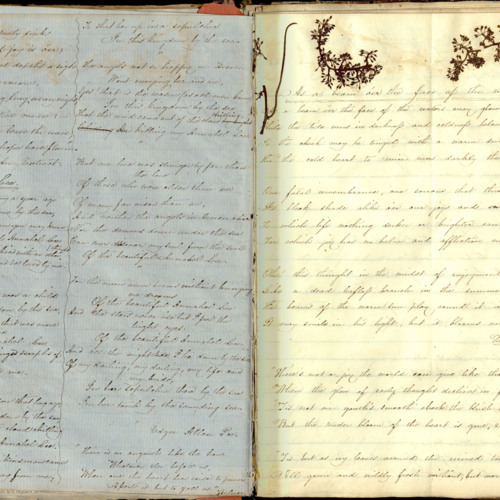 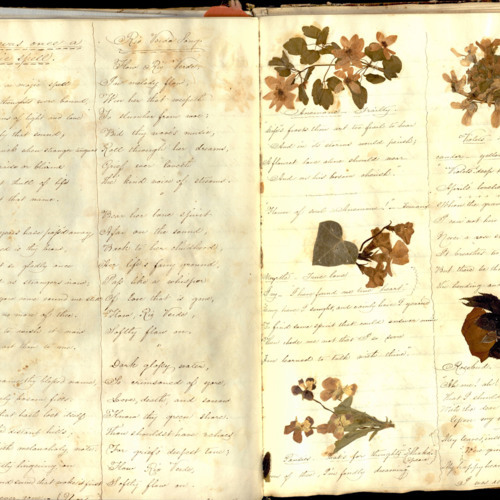 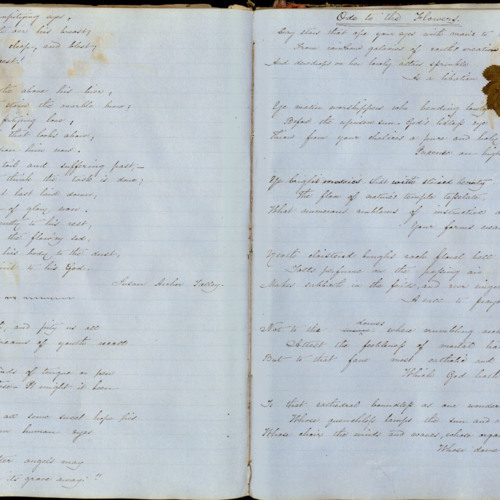 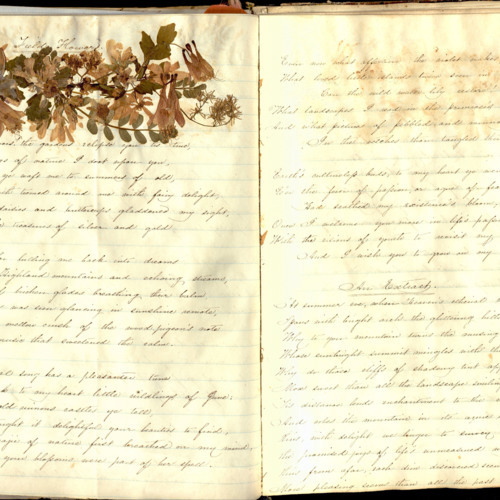 A scrapbook of poetry, newspaper clippings and pressed flowers from the 1860s, likely created by Virginia Bedinger Lucas, younger sister of Daniel Bedinger Lucas. 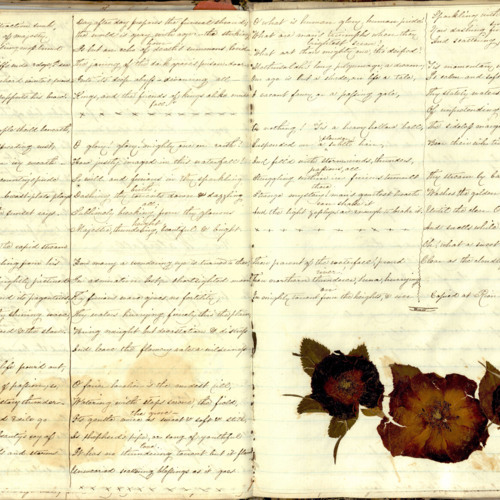 Virginia was born December 16, 1837 and died April 27, 1867. 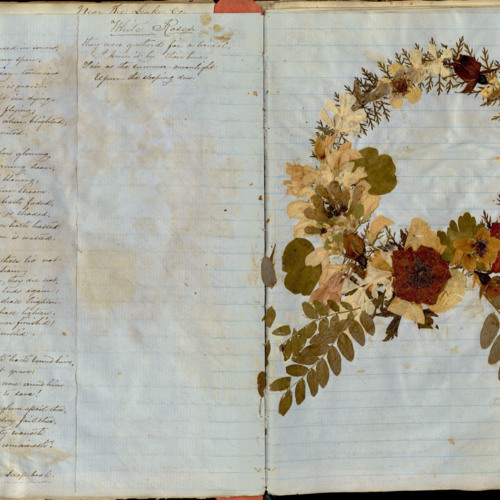 Daniel was born March 16, 1836 and died June 24, 1909. 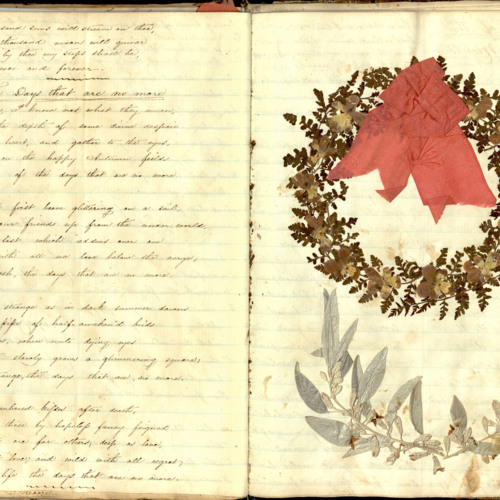 Both were born, at Rion Hall near Charles Town, Virginia (now West Virginia). 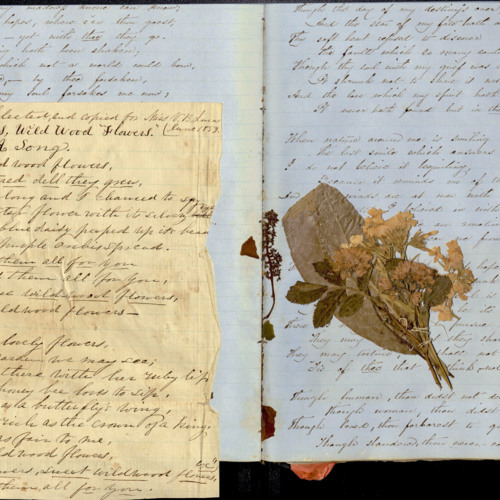 The two siblings shared a love and talent for poetry. 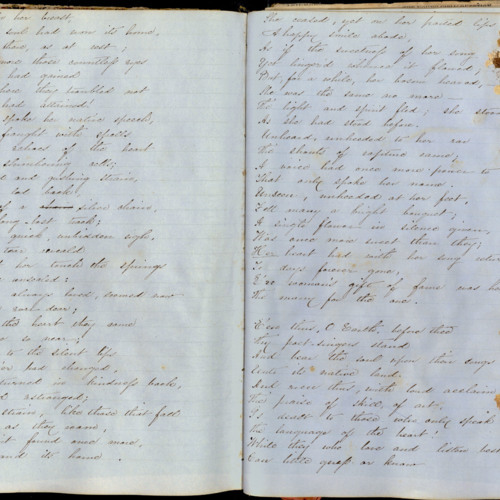 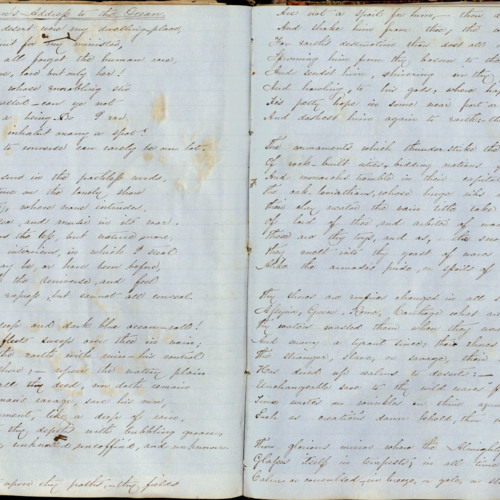 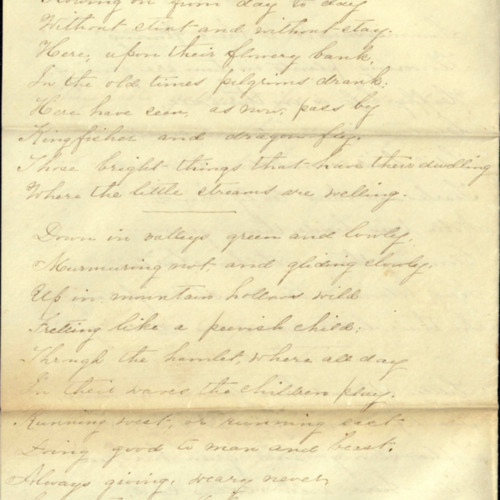 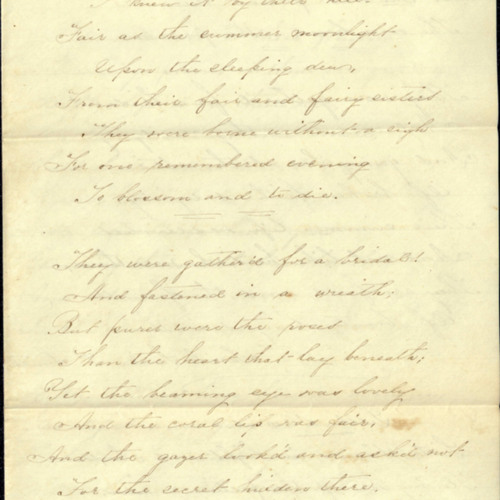 Though never published during her short lifetime, several of Virginia's poems were published in Daniel's 1869 volume, The Wreath of Eglantine, and Other Poems. 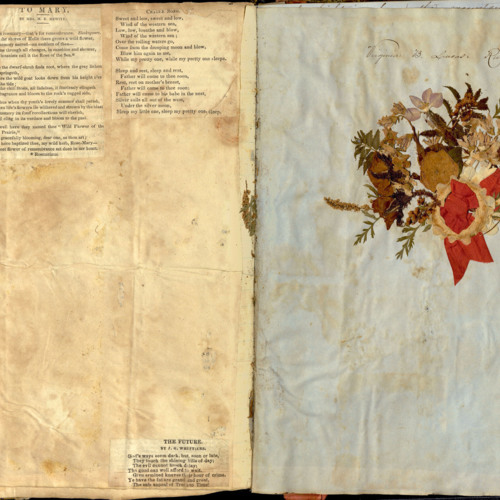 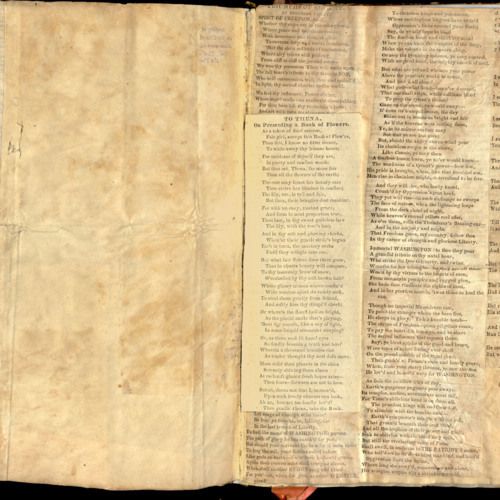 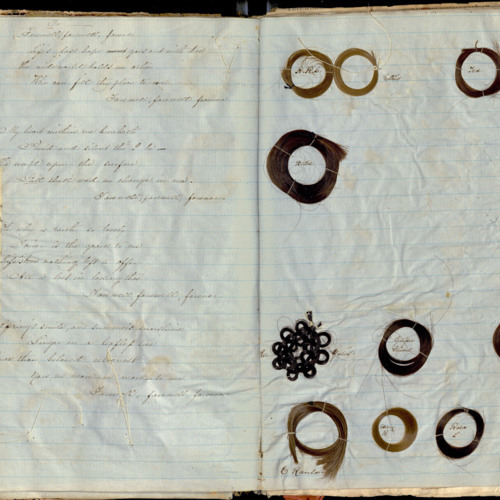 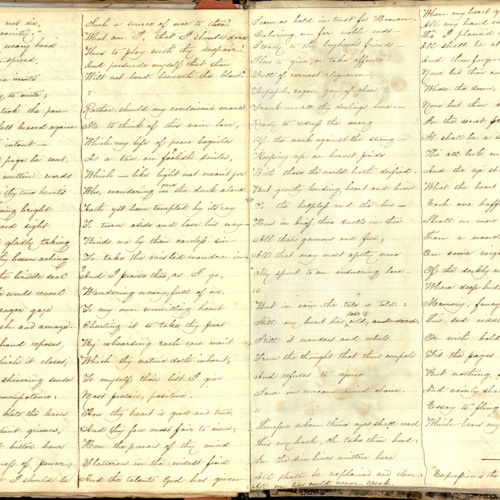 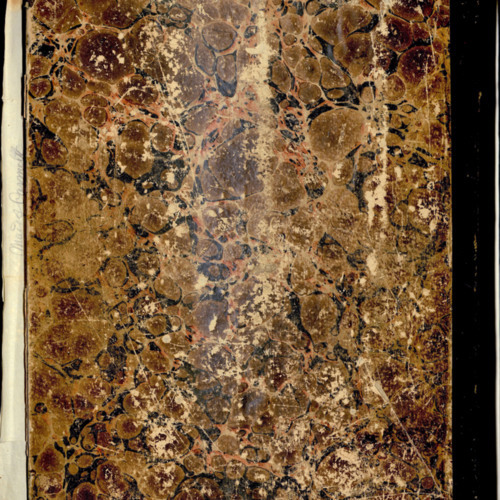 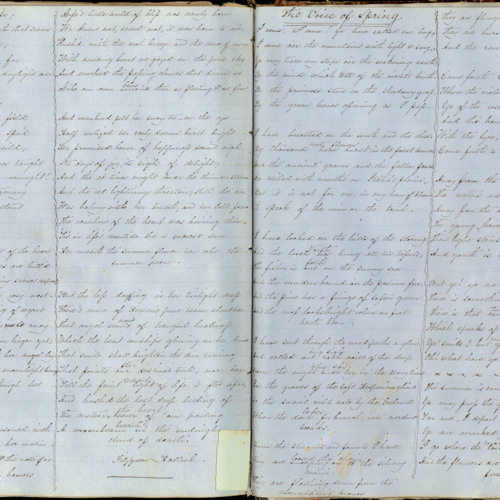 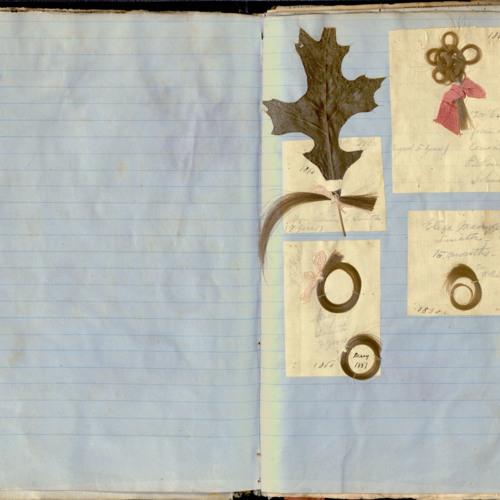 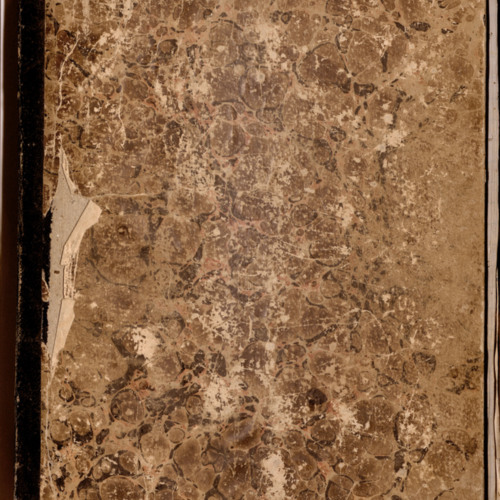 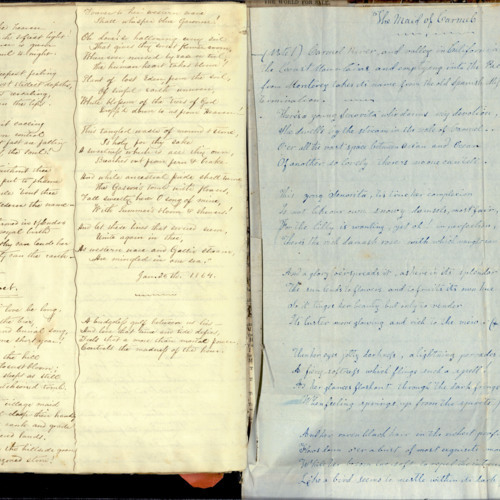 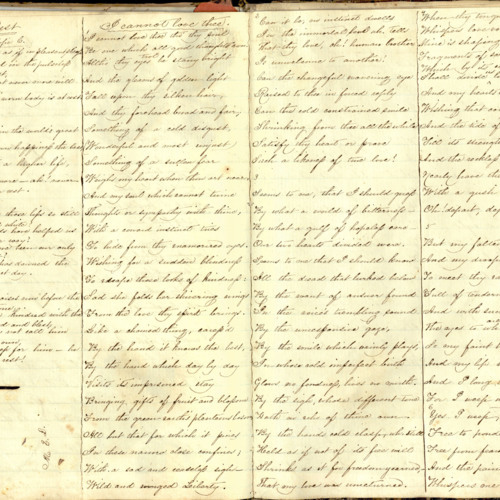 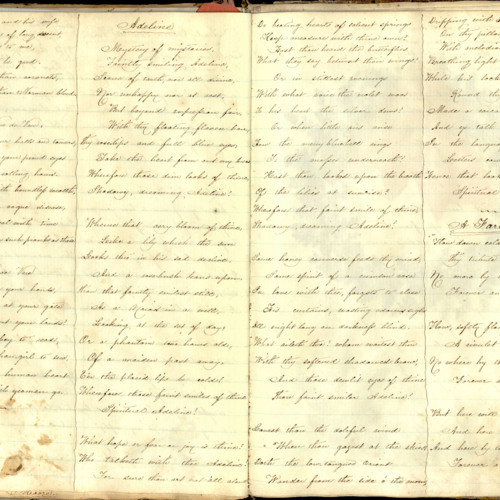 The bulk of the material in the collection of which this scrapbook is a part was either created by or relates to Daniel Bedinger Lucas. 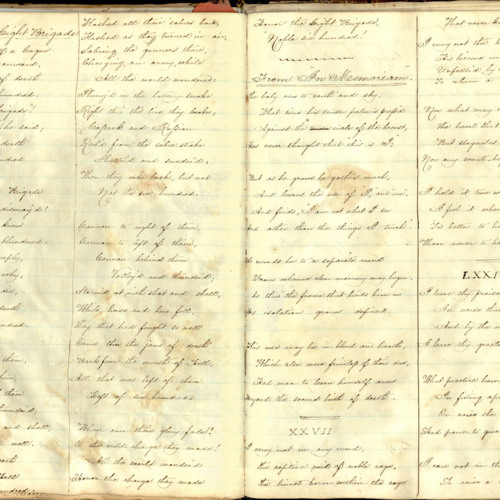 He attended the University of Virginia, and then studied law under Judge John W. Brockenbrough of Lexington, Virginia. 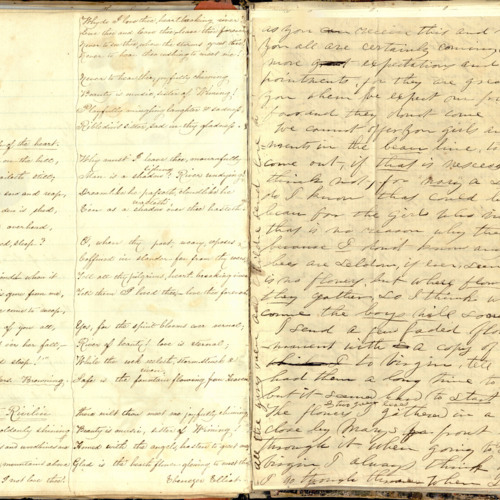 In 1859 he began practicing law at Charles Town but moved the next year to Richmond. 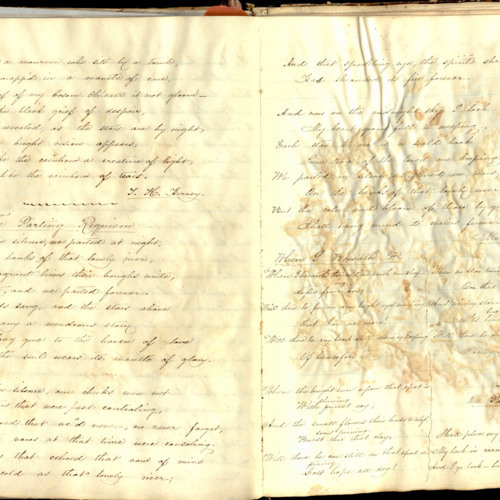 At the beginning of the Civil War in 1861 he joined the staff of General Henry A. 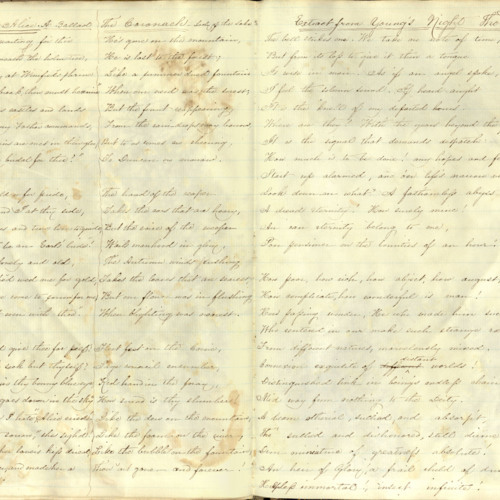 Wise and took part in the Kanawha Valley campaign, but his physical disability from a childhood spine injury kept him from active service in the last years of the war. 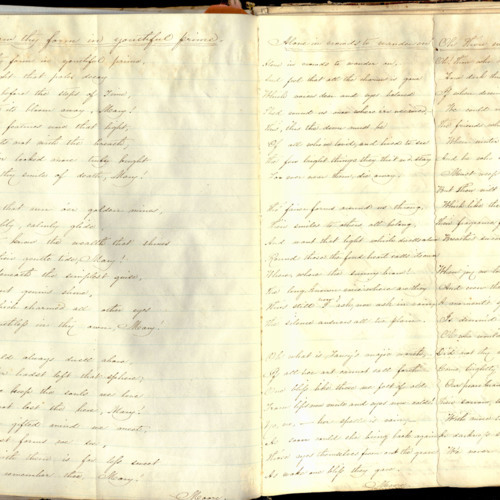 Toward the end of the war he ran the blockade to defend his friend John Yates Beall, accused of being a Confederate spy, but was unable to defend him against the charges. 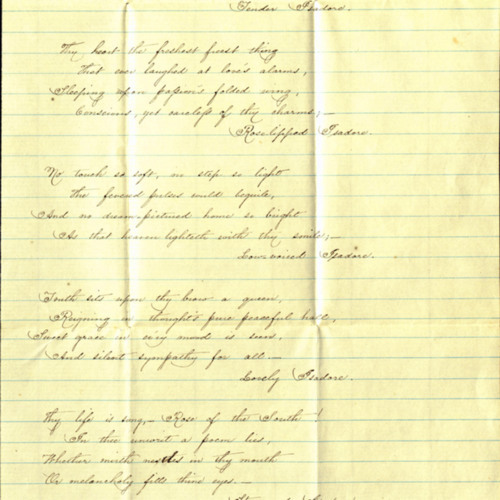 Beall was executed on Governors Island, New York. 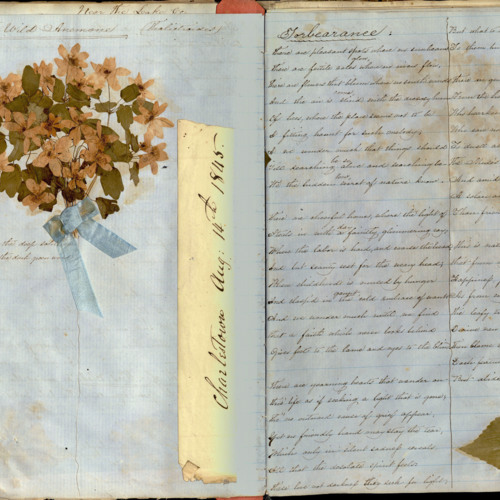 In 1869, Lucas married Evalina (Lena) Tucker Brooke, of Richmond. 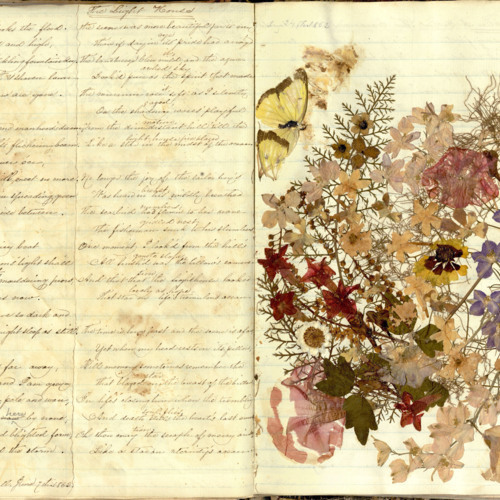 Their only child, Virginia, was born in 1873. 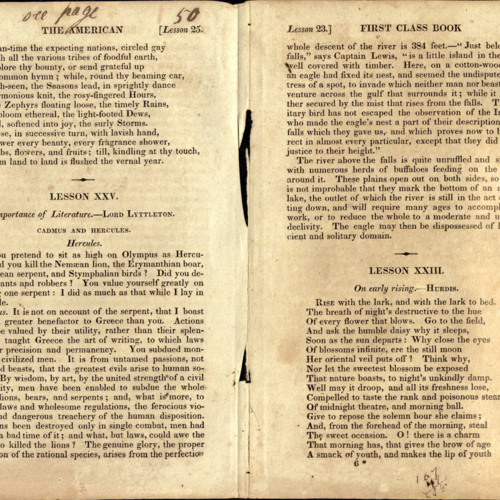 Barred from the practice of law until 1871, due to restrictions on the service of ex-Confederates, Lucas turned to literature and became co-editor of the Baltimore Southern Metropolis. 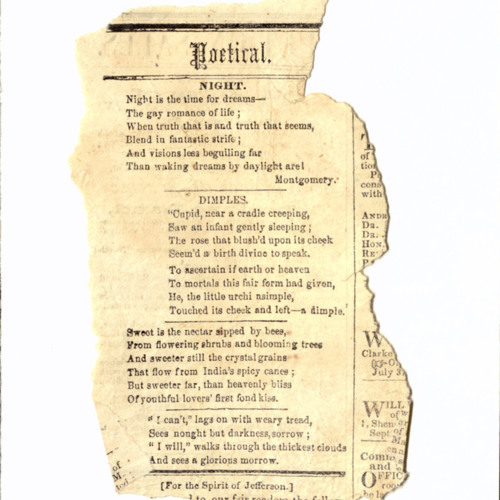 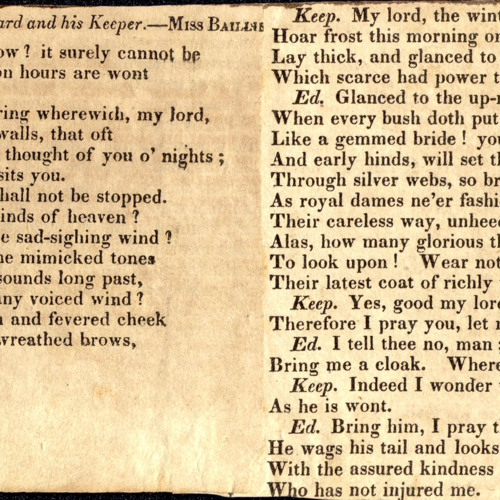 Many of his poems were published in this magazine. 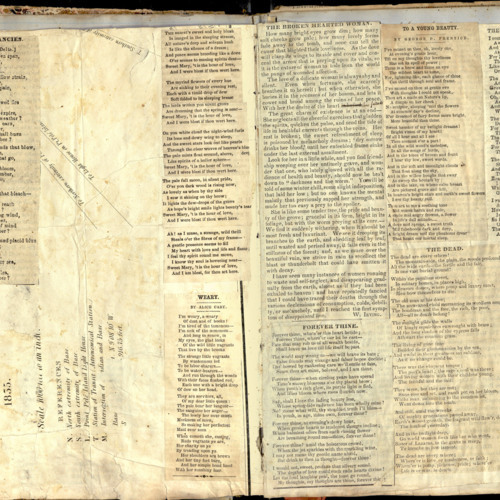 He reentered the practice of law in 1871 and took a prominent role in the Democratic party politics of West Virginia, acting as Democratic elector in the elections of 1872 and 1876, to the legislature in 1884 and 1886, and as a member of the supreme court of appeals from 1889 to 1893. 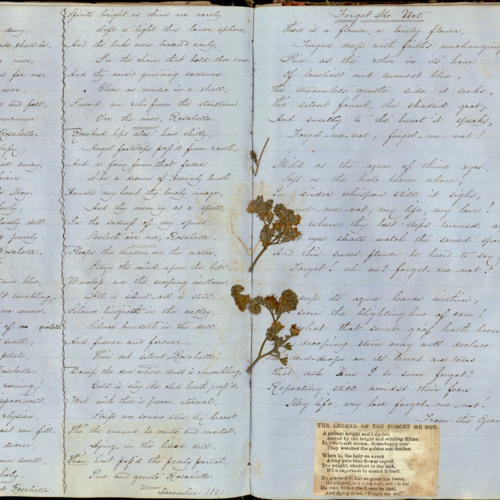 Lucas's volumes of poetry include The Wreath of Eglantine (1869) and Ballads and Madrigals (1884). 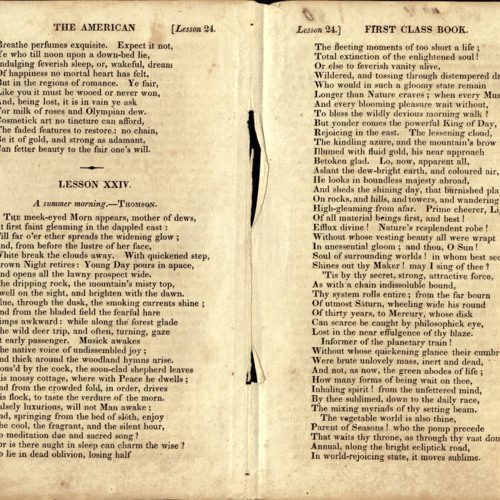 He wrote three plays about the Civil War. 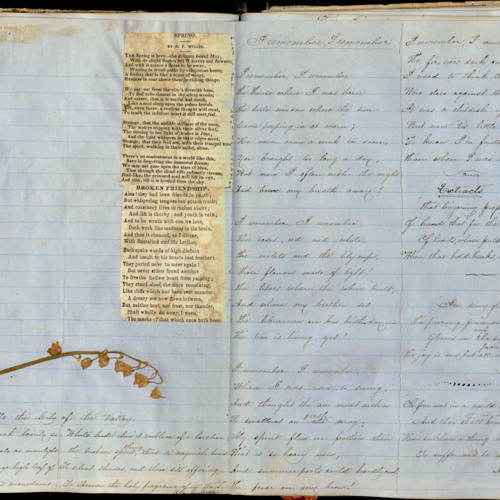 His books include The Memoir of John Yates Beall (1865) and Nicaragua, War of the Filibusters (1896). 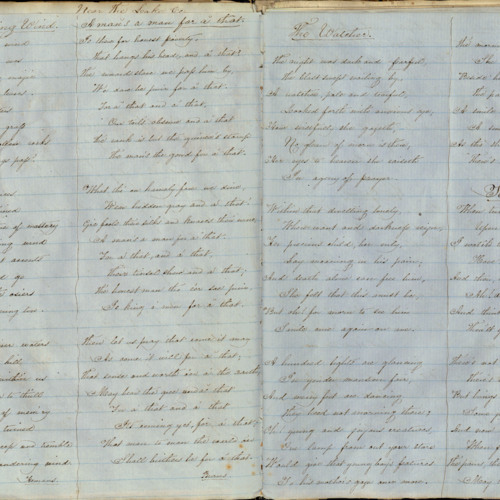 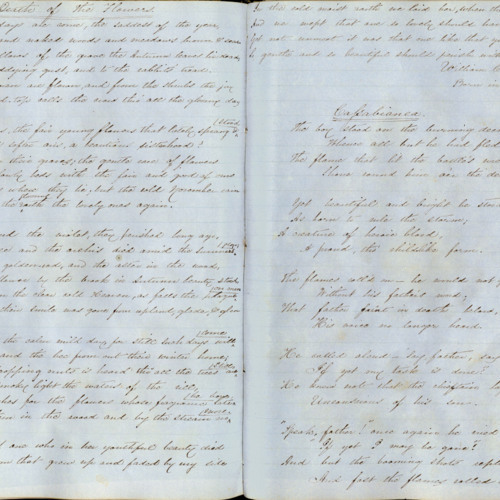 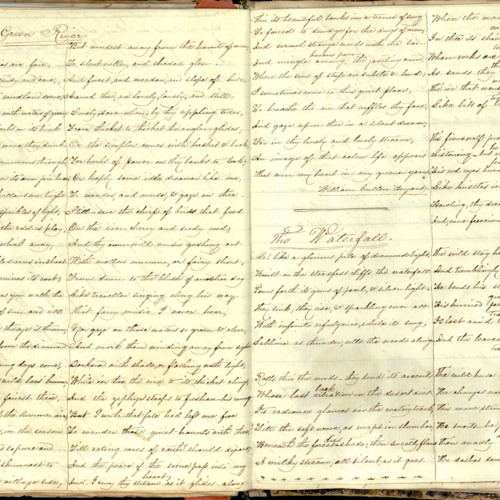 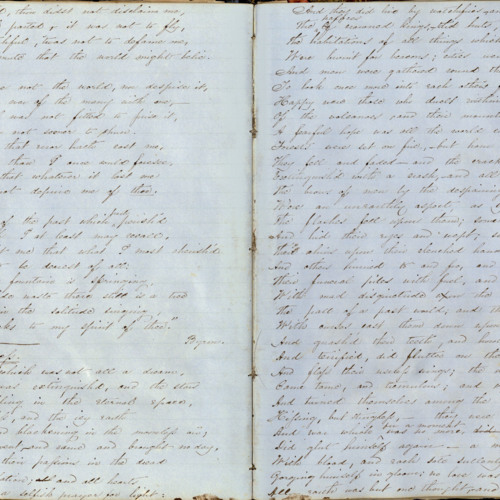 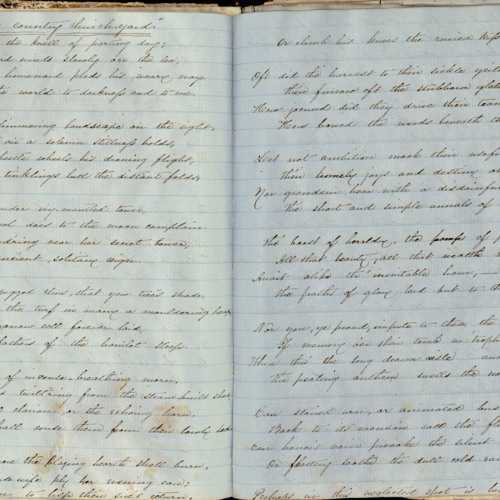 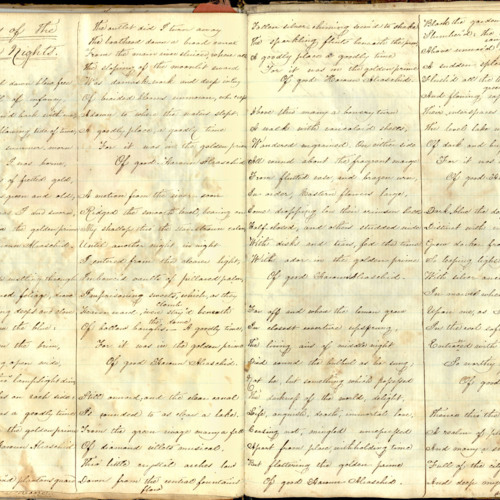 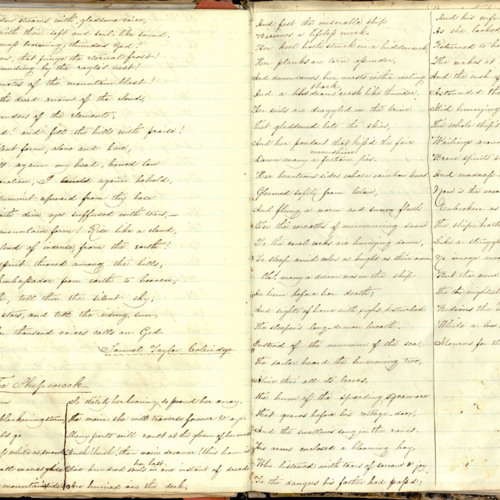 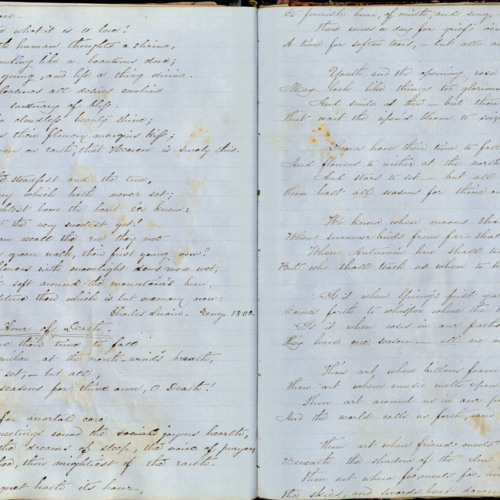 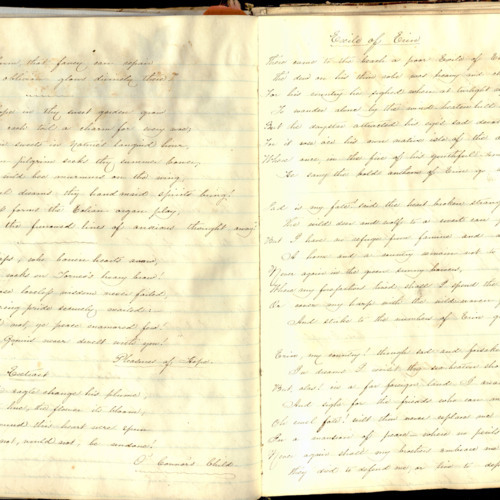 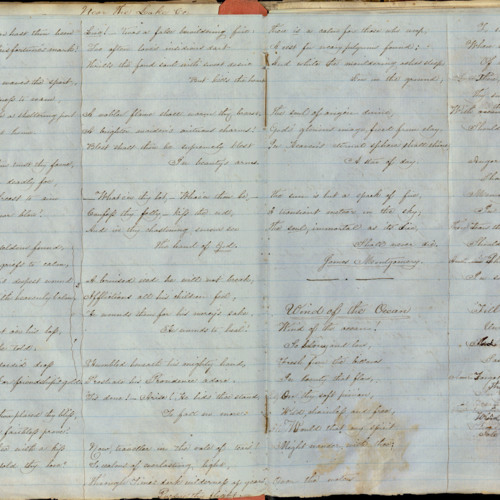 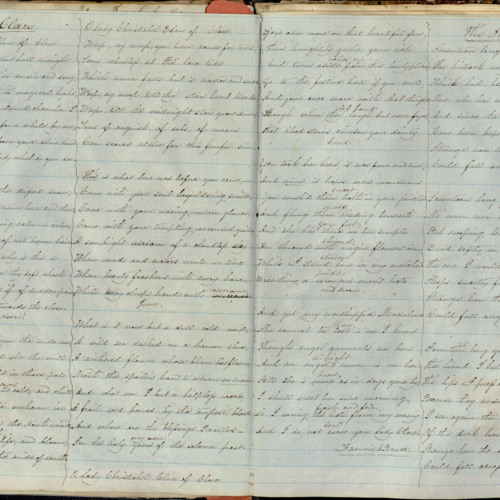 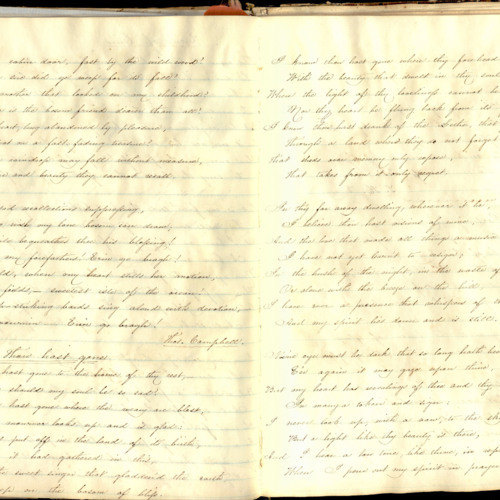 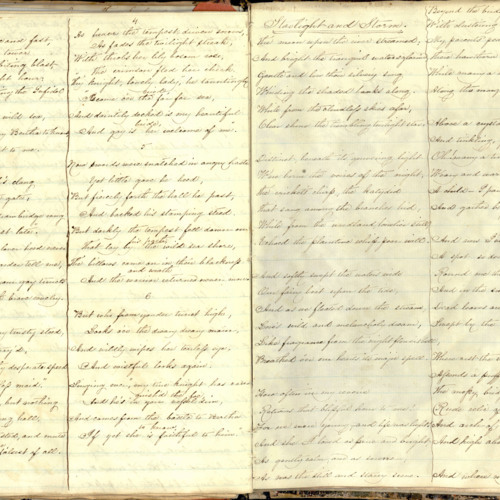 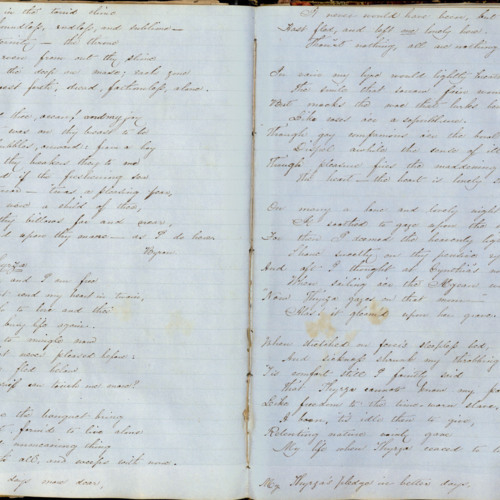 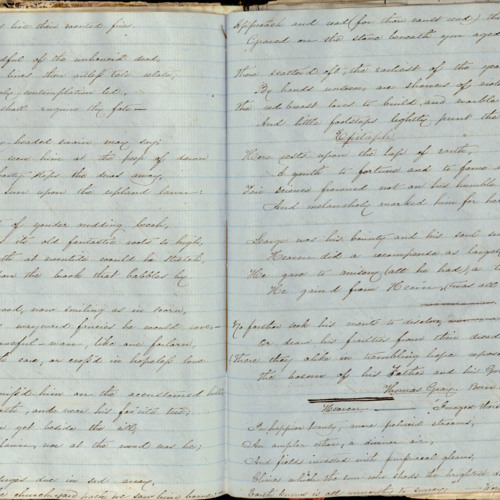 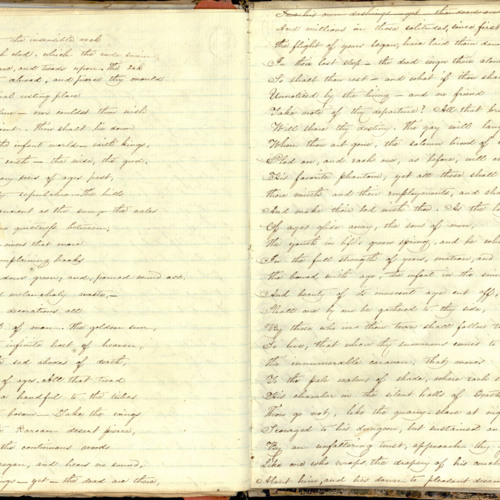 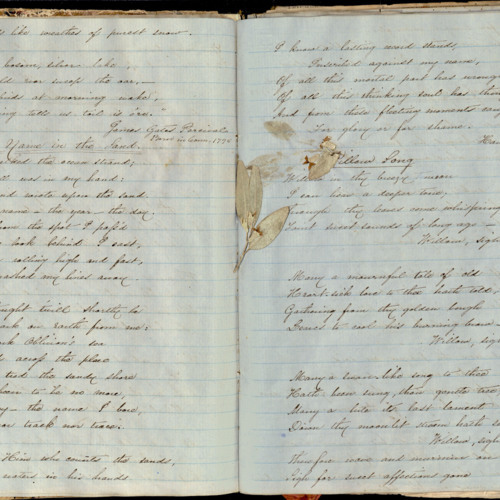 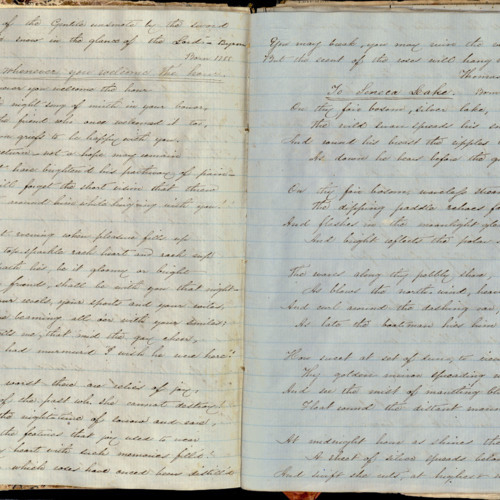 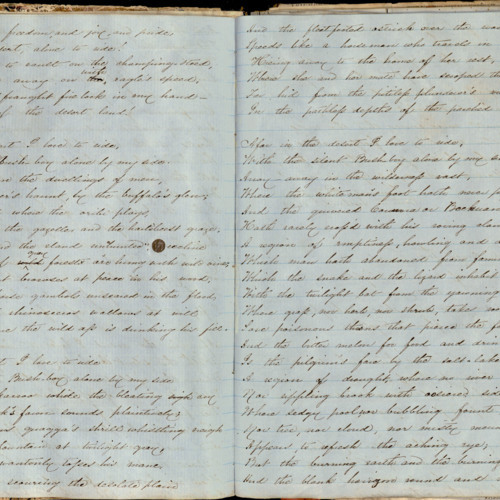 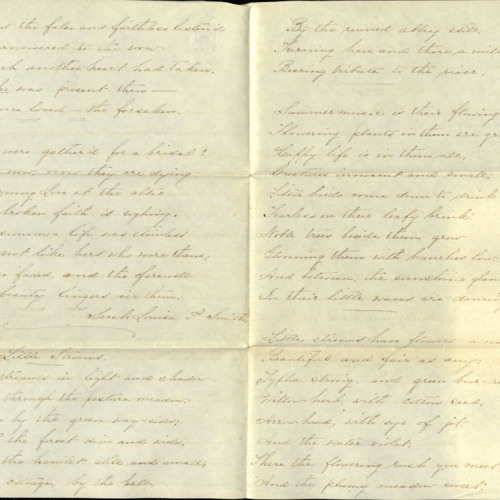 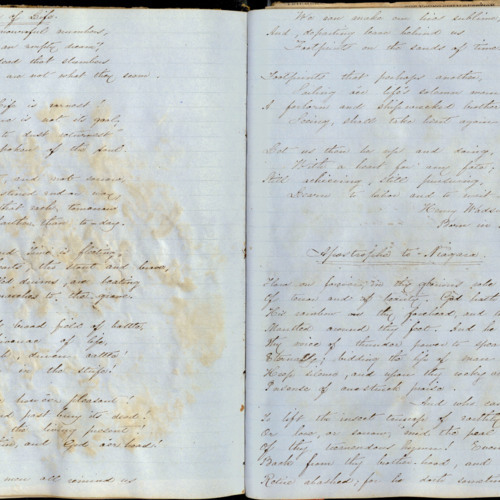 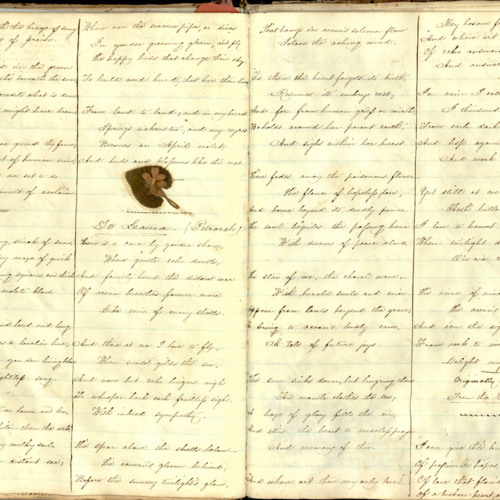 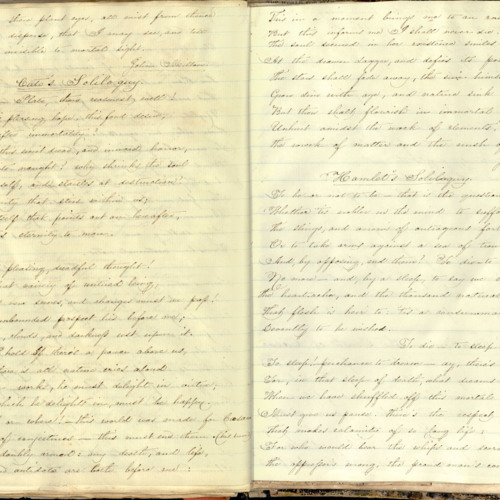 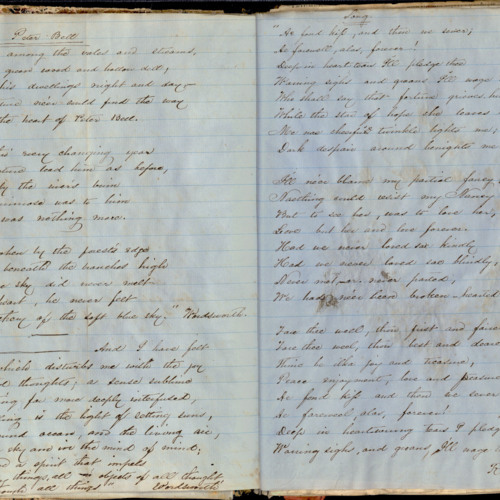 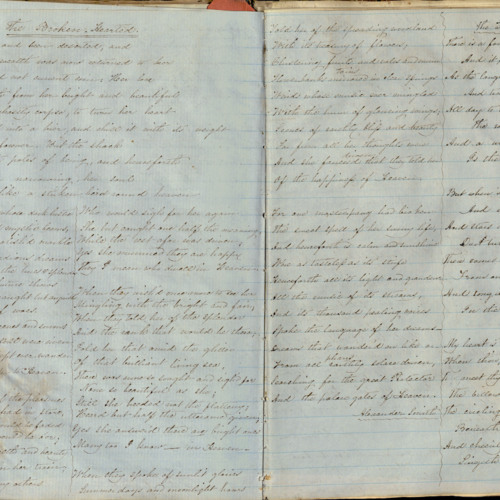 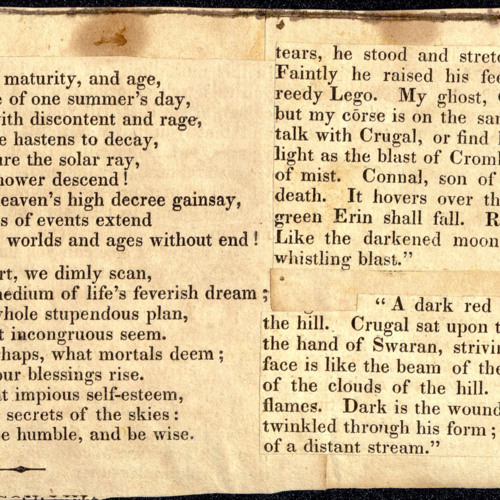 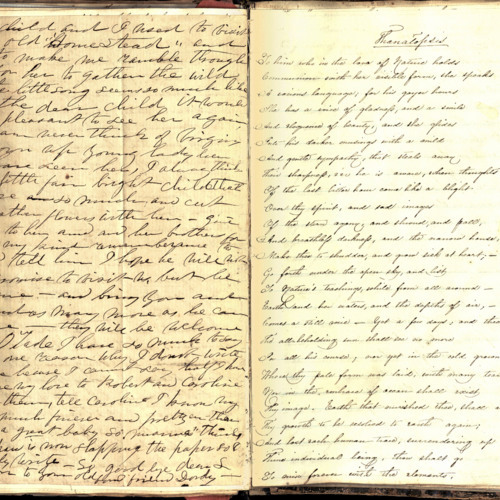 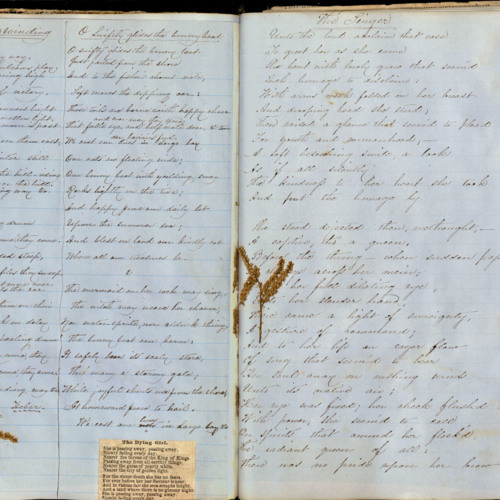 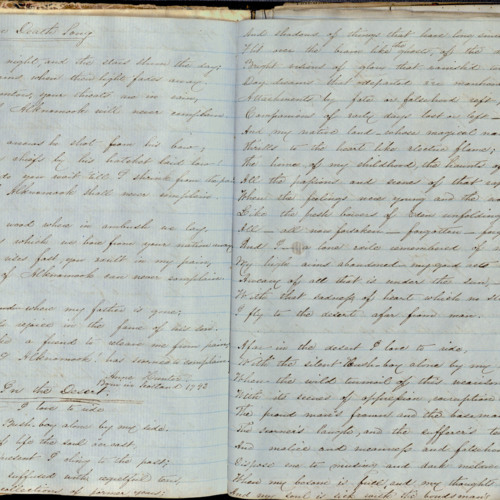 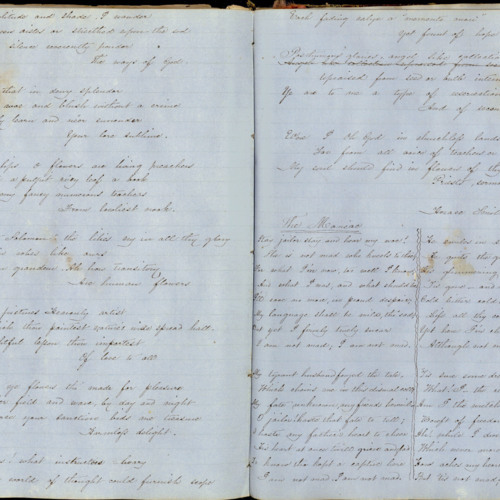 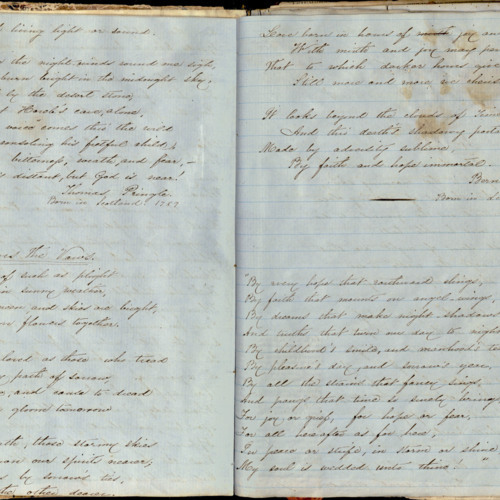 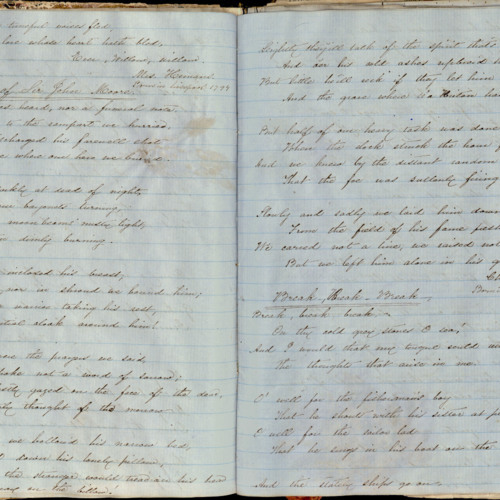 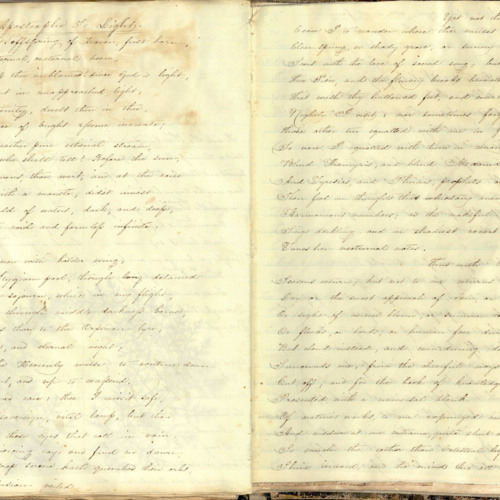 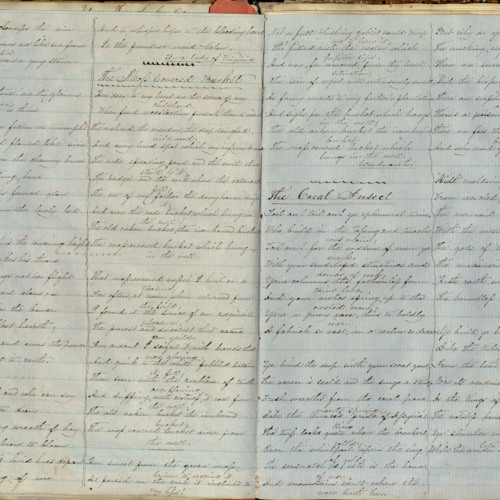 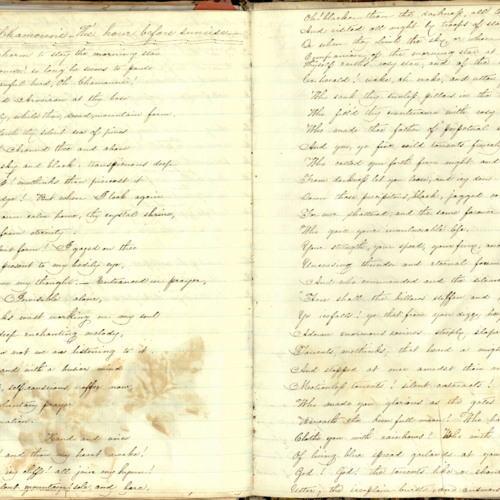 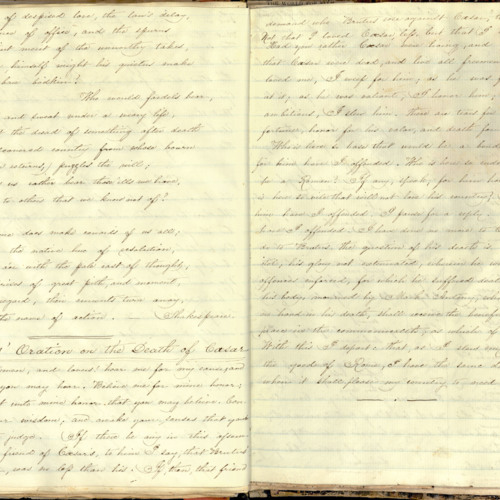 He was known as the "poet of the Shenandoah Valley." 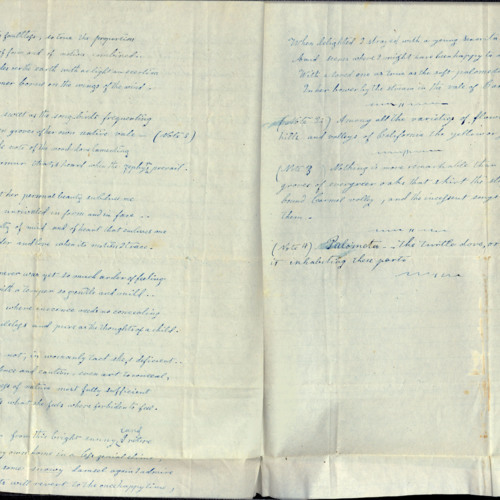 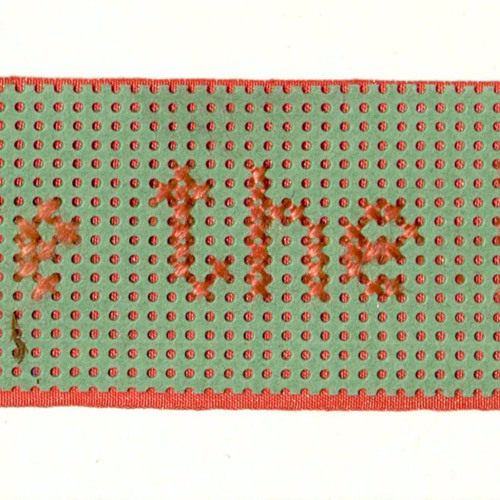 Permission to publish material from the Daniel Bedinger Lucas Papers must be obtained from Special Collections, Virginia Tech. 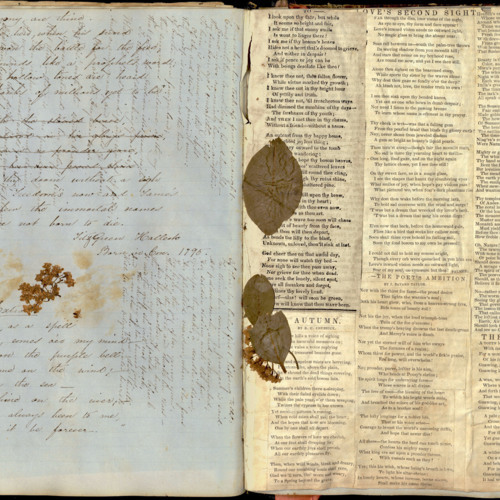 Researchers wishing to cite this collection should include the following information: Daniel Bedinger Lucas Papers, Ms1995-012, Special Collections, Virginia Polytechnic Institute and State University, Blacksburg, Va.
Lucas, Virginia Bedinger, 1837-1867, “Scrapbook of poetry, newspaper clippings and pressed flowers, likely by Virginia Bedinger Lucas, sister of Daniel Bedinger Lucas, c. 1860s (Ms1995-012),” VT Special Collections Online, accessed April 23, 2019, http://digitalsc.lib.vt.edu/Appalachia/Ms1995-012_Scrapbook.